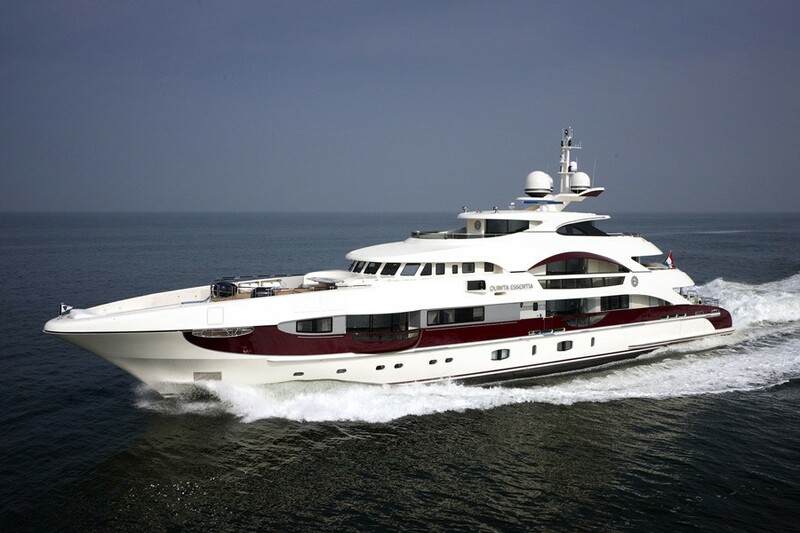 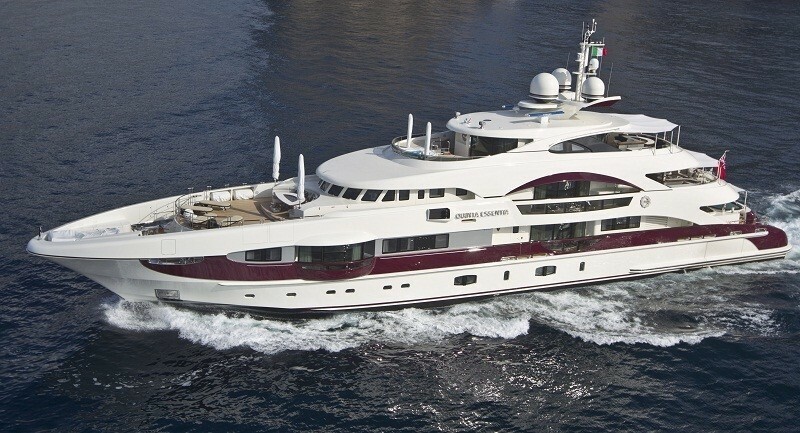 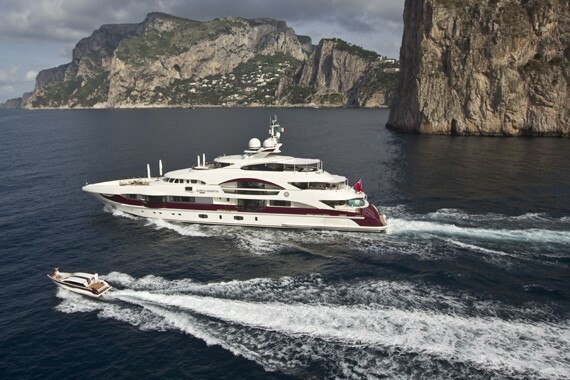 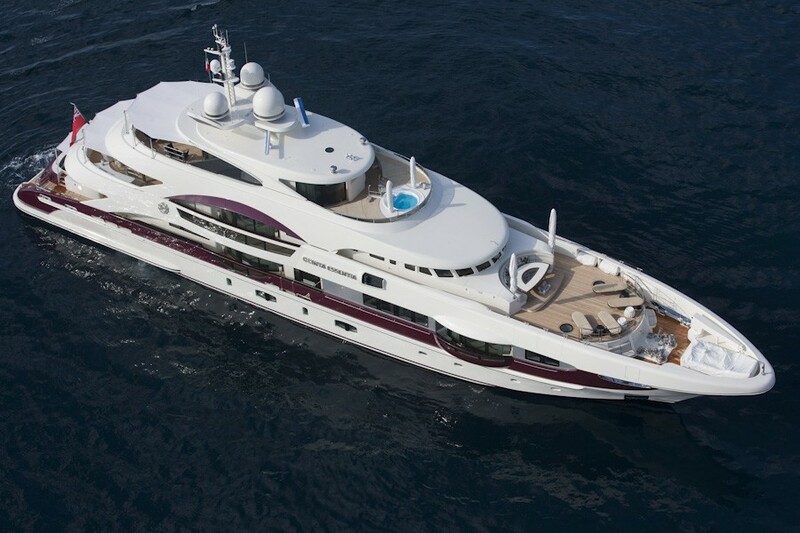 Motor Yacht QUITE ESSENTIAL is a 55 metre (180ft) luxury superyacht launched by the Dutch shipyard Heesen Yachts in 2011. 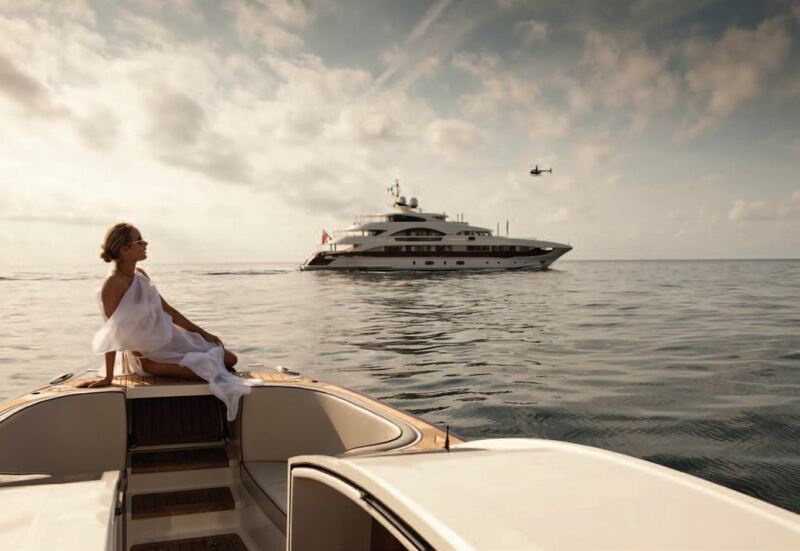 Yacht QUITE ESSENTIAL is a beautifully designed and constructed yacht boasting a striking hull design coloured in a creamy white with a contrasting deep metallic red stripe, covering the transom and running from the stern, almost to the bow. 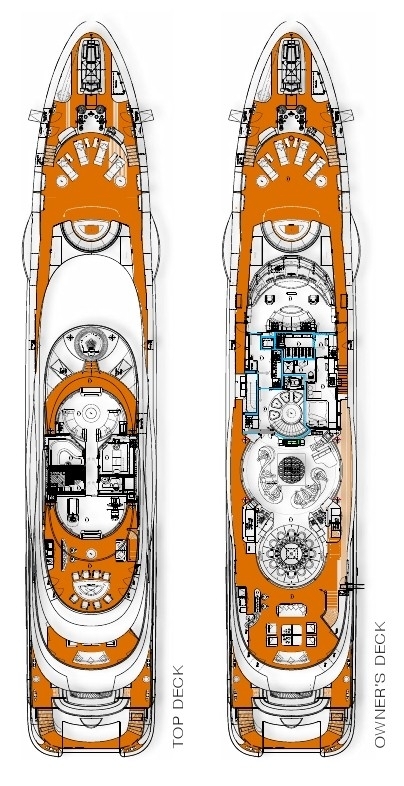 The 55 metre semi-displacement QUITE ESSENTIAL Yacht (ex Quinta Essentia, YN 14955) was designed by Van Oossanen Naval Architects in collaboration with Heesen Yachts' in-house designers. 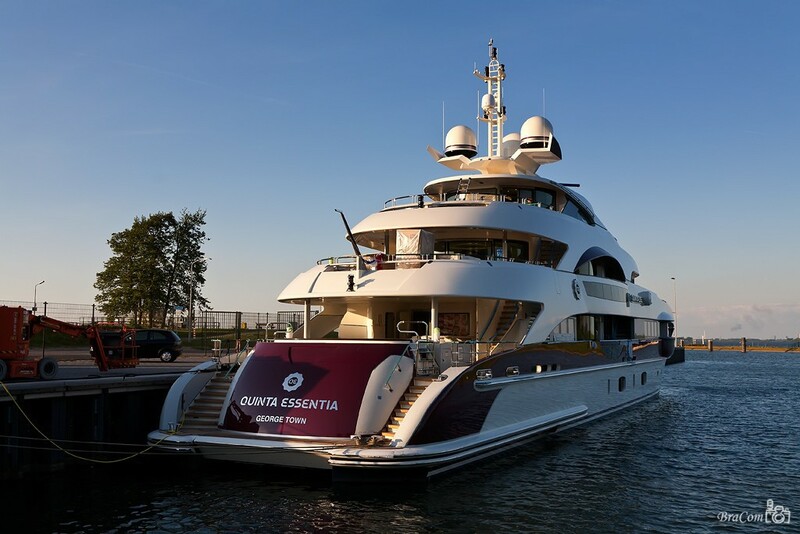 Her exterior designer is Frank Laupman of Omega design studio and Ken Freivokh carried out the l interior design layout, with interior design by Michela Reverberi. 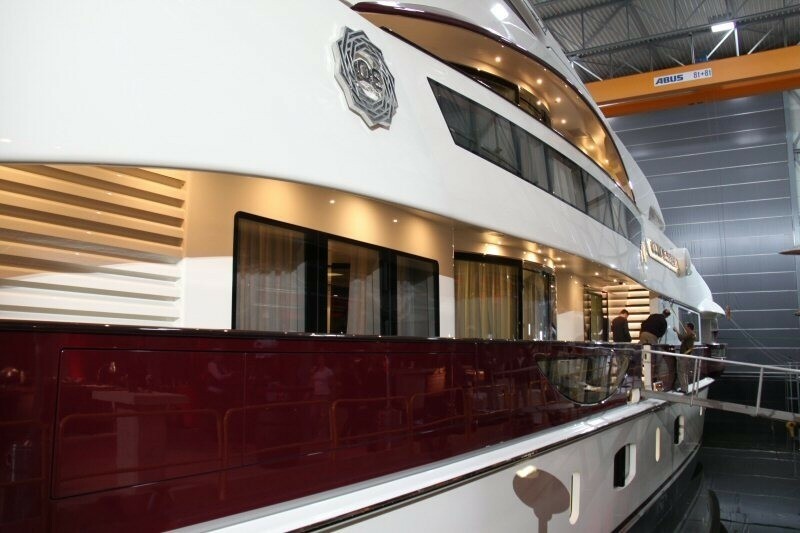 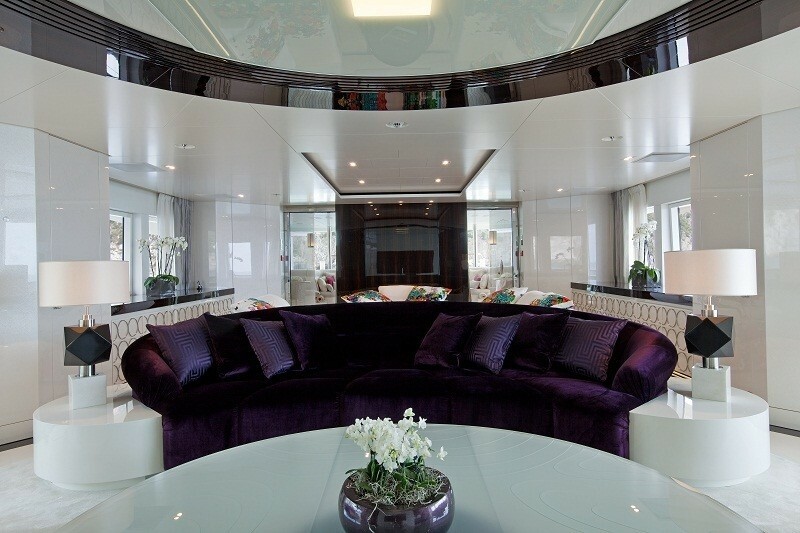 A unique feature of the hull design are dramatic signature curved-window “balconies” extending from the owner’s suite forward on the main deck, the main deck saloon and the upper deck saloon immediately above. 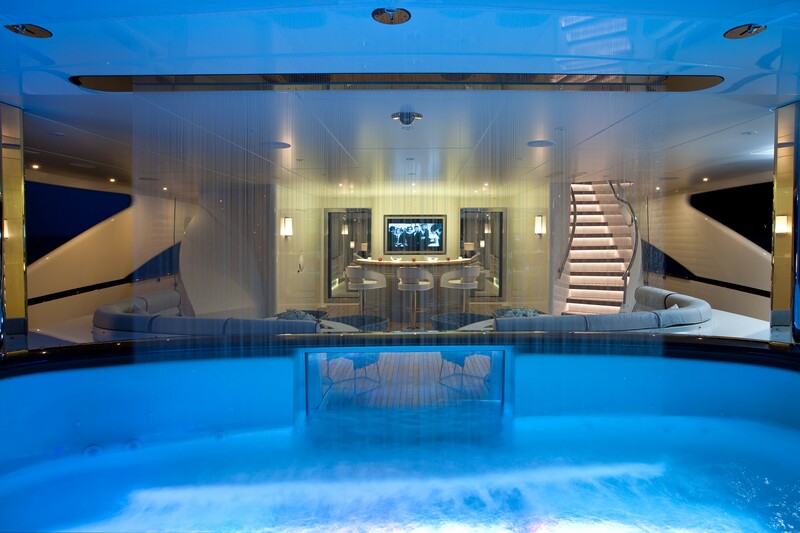 In each case, the bulwarks are glazed to allow clear views of the water, even when seated inside. 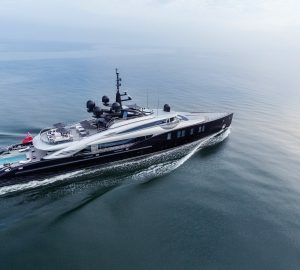 Superyacht QUITE ESSENTIAL has a design that offers some notably luxurious features including the largest owner’s suite seen on any Heesen superyacht to date, comparable to those found on yachts of 80m or above. 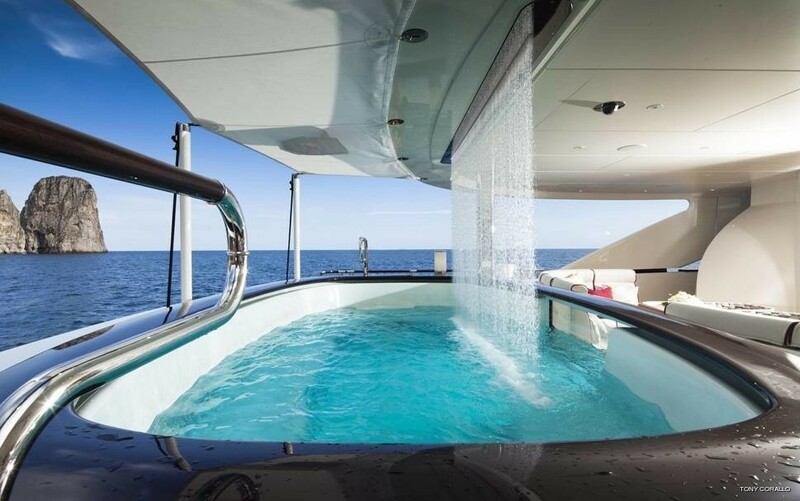 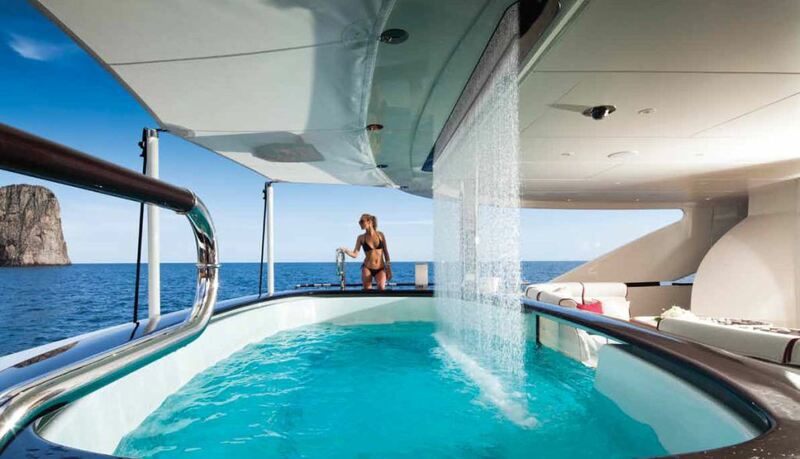 Other special features of the yacht include a sport a tender bay that can be flooded to allow easy launching and recovery of the tenders, a swimming pool, aft on the main deck that is constantly replenished by a sheet waterfall. 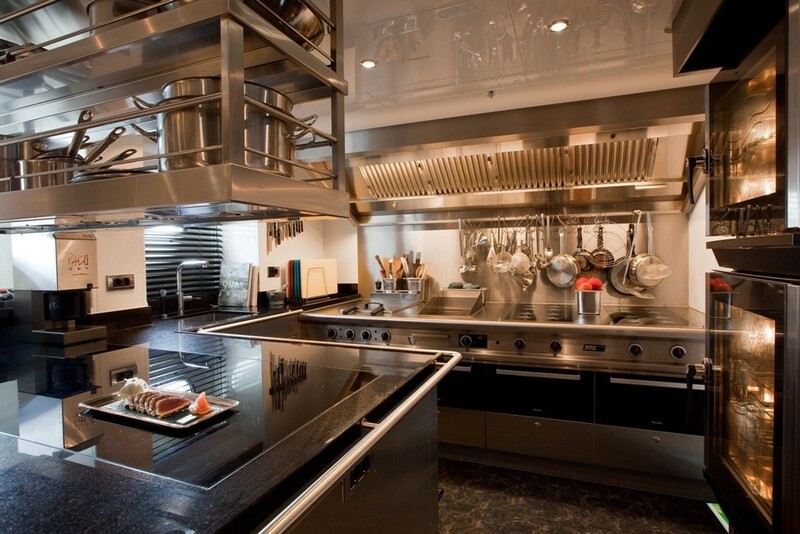 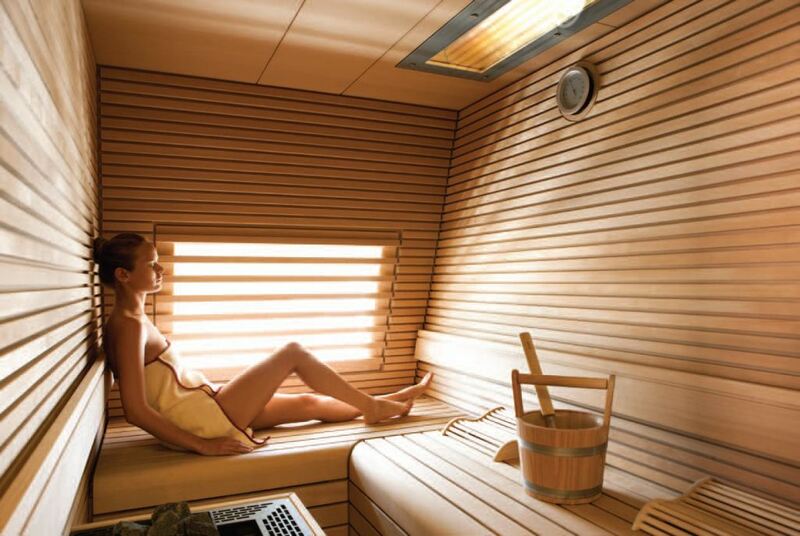 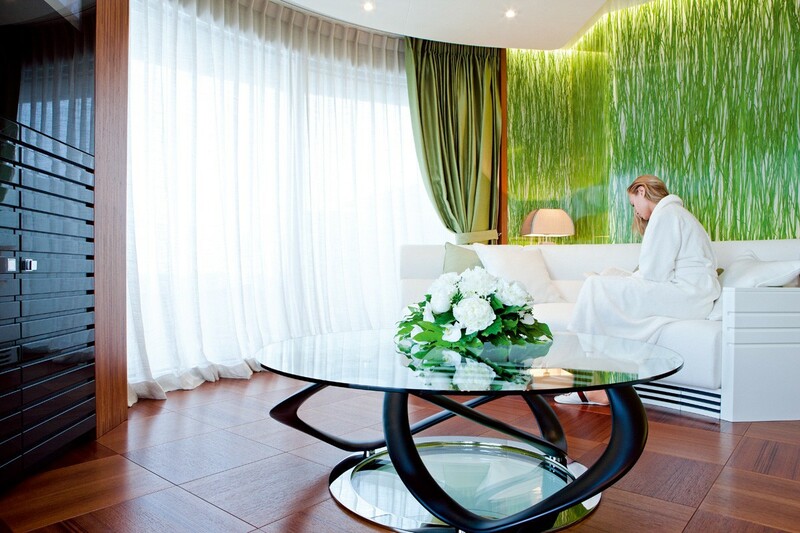 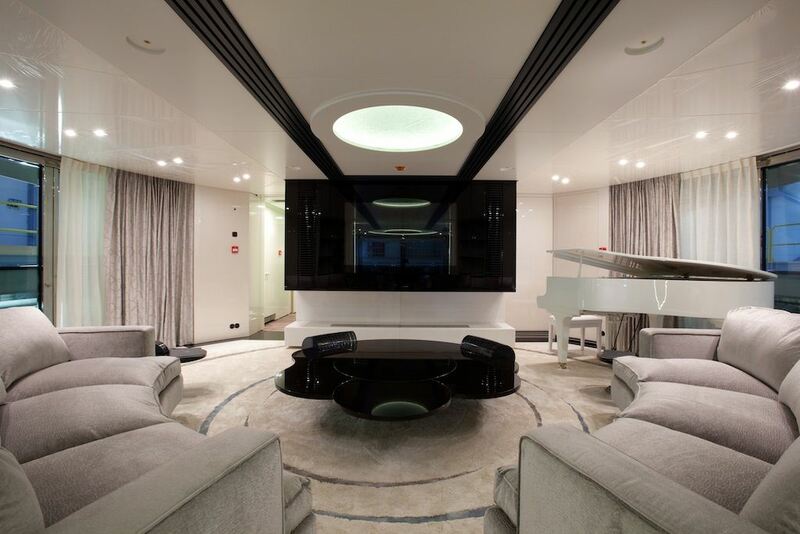 The owners guests will also love the gym and spa facilities, including a steam room and a massage room, located on the sun deck and the grand piano in the main saloon. 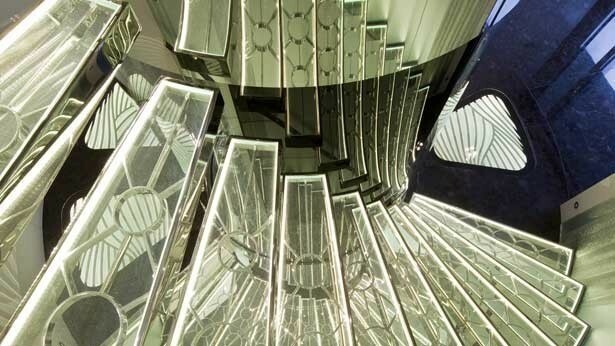 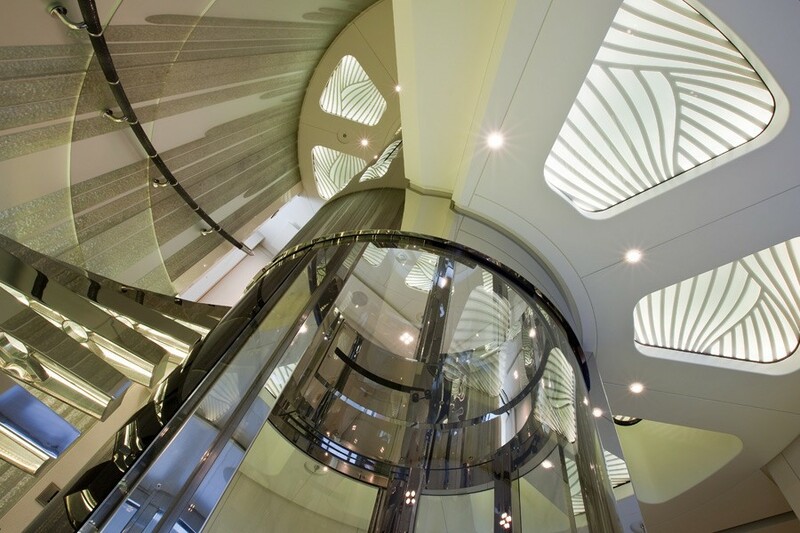 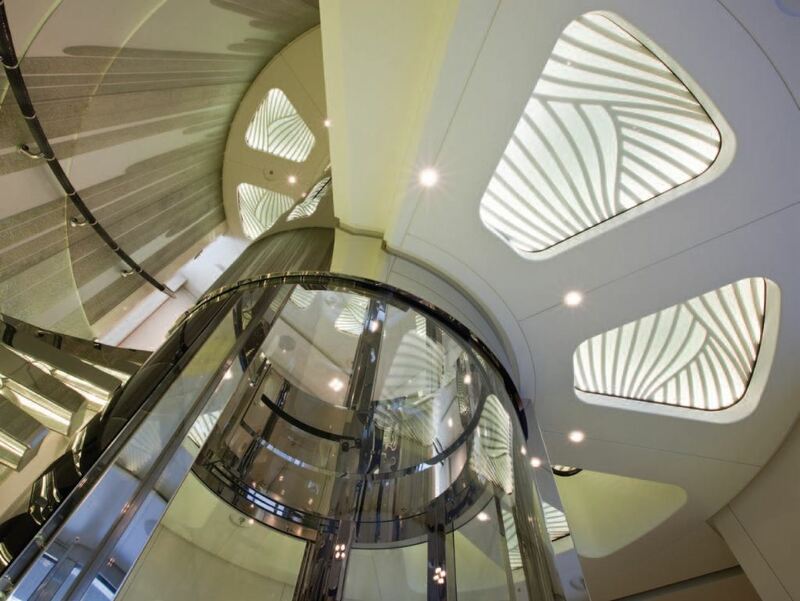 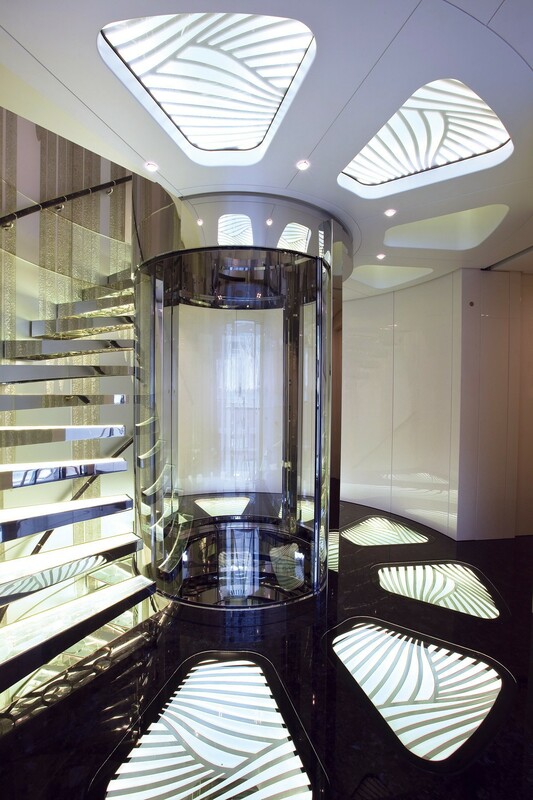 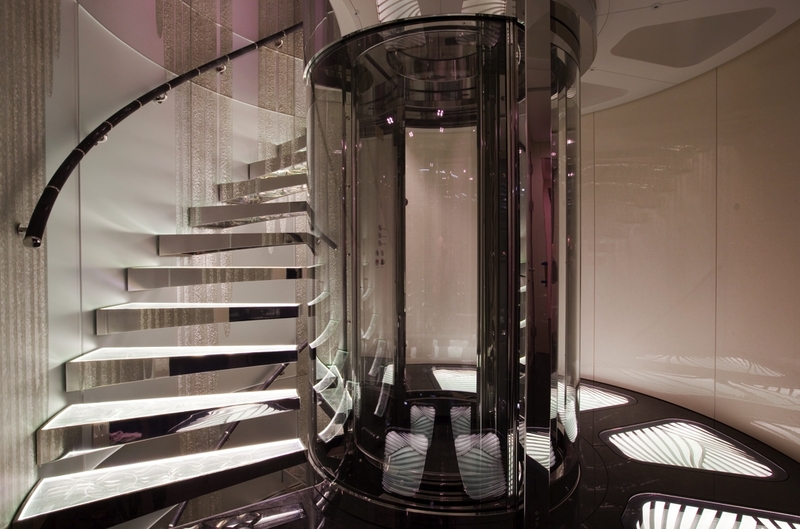 An atrium of decorative glass, rising through three levels from the main deck, encompasses a spiral staircase and an elevator of glass and stainless steel. 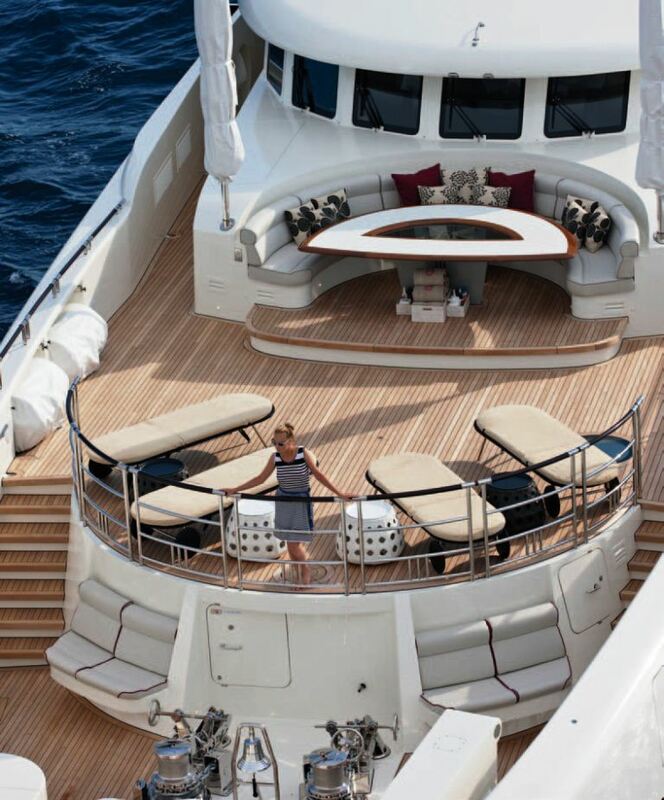 Three expansive decks offer guests on charter yacht QUITE ESSENTIAL a wide variety of areas in which to relax, to take the sun and entertain. 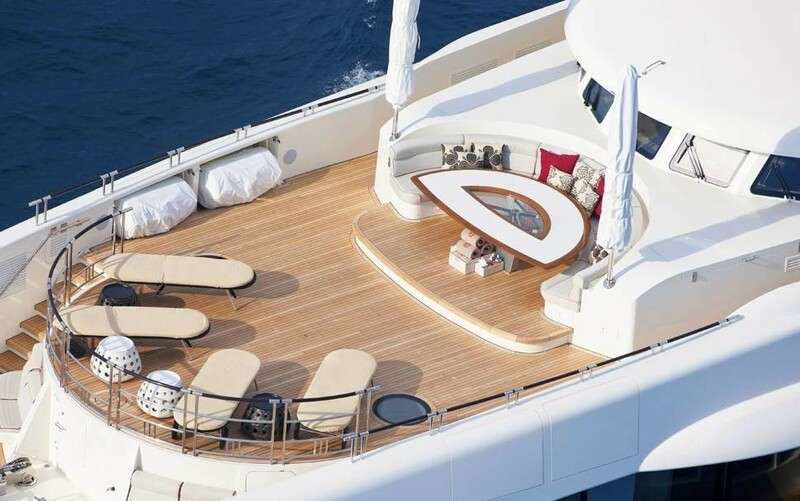 Deck areas have been carefully designed to offer maximum enjoyment and comfort, their unobstructed views emphasising the sense of spaciousness. 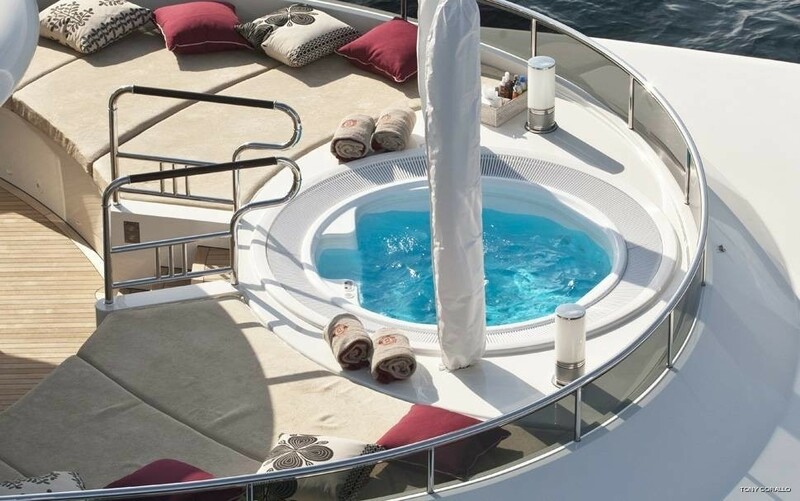 Relaxon on the Sun deck in the spa pool or burn off energy in the adjoining a fully-equipped spa, entertain guests on the aft deck before dinner, enjoy breakfast or an aperitif on the top deck, or sip a tantalising cocktail on the spa foredeck. The luxurious and conceptual interior design by Michela Reverberi is modern and futuristic with an intimate atmosphere that is not too stark. 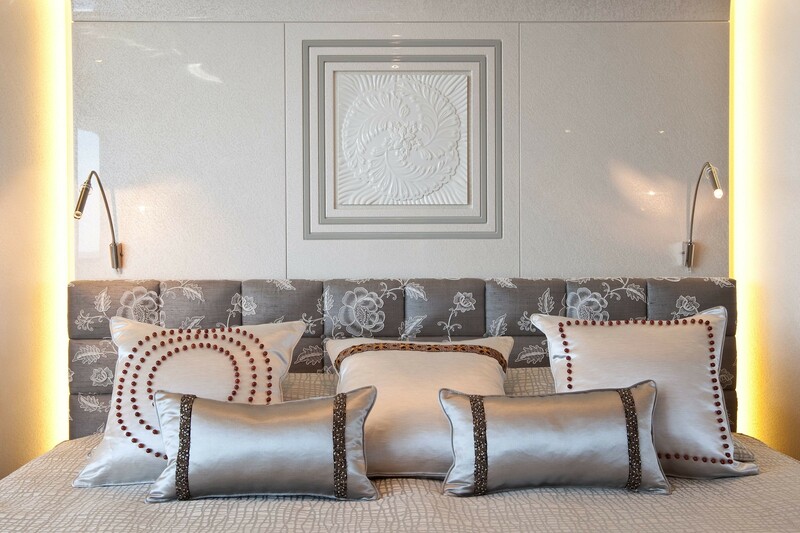 The inspiration for interior design work was ‘Quinta Essentia’ – the fifth element, which is the highest synthesis of the four elements. 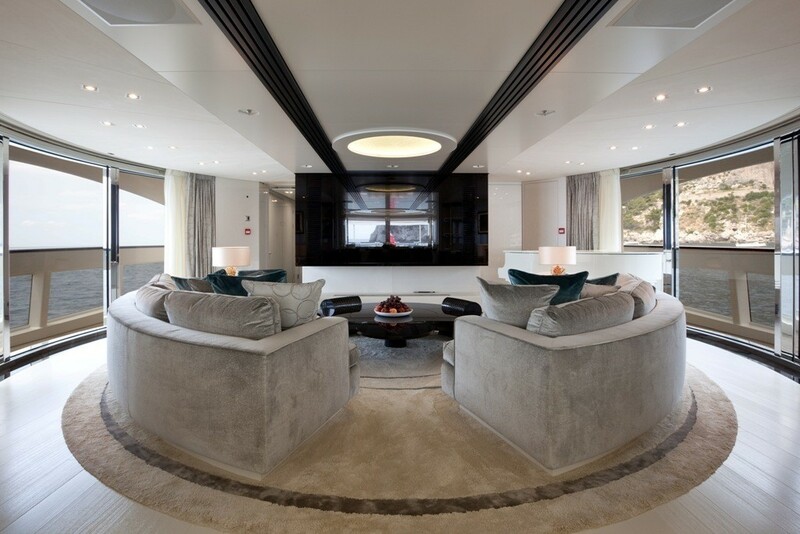 These four elements – Earth, Water, Air and Fire are represented in the four guests’ cabins, while the owners’ suite with a sliver colour palate synthesizes them all. 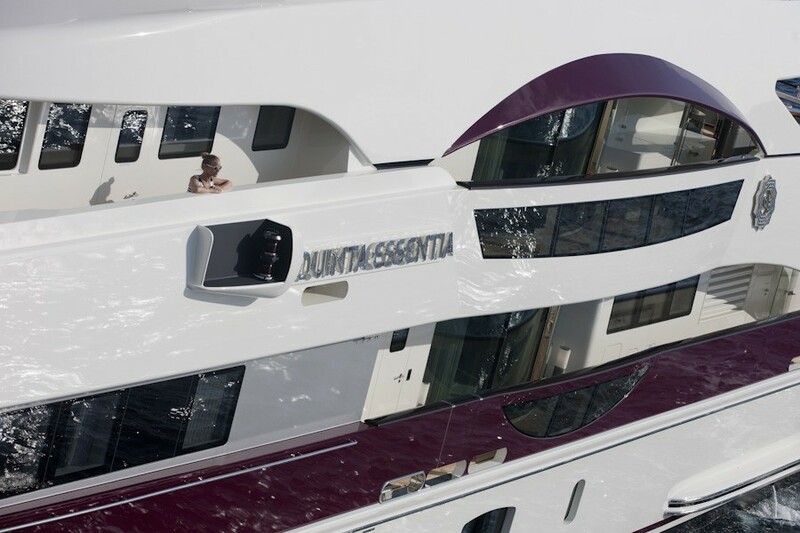 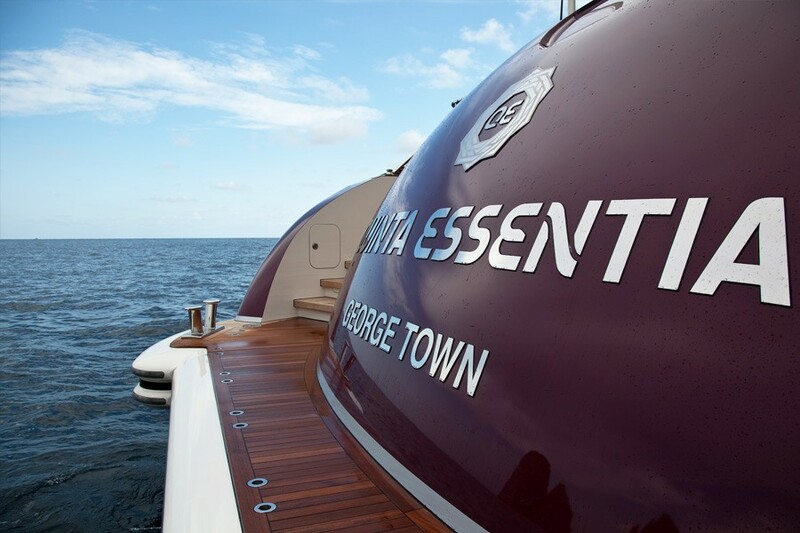 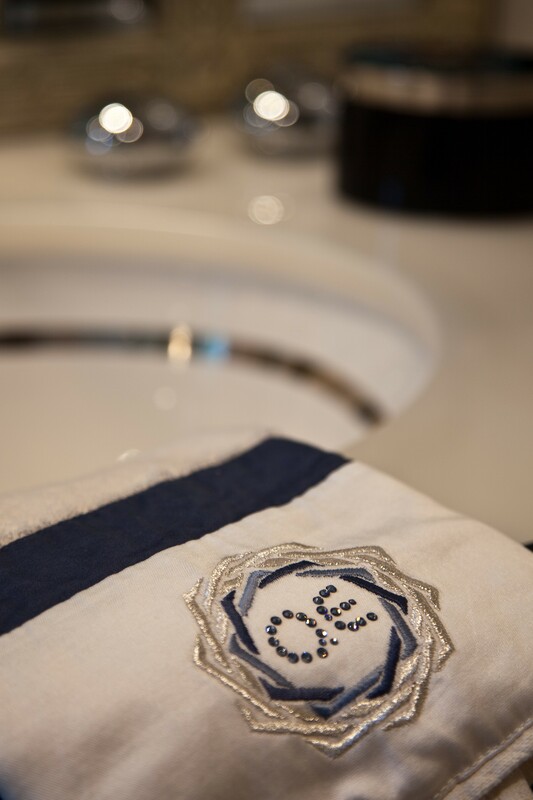 The 5th element theme of Quinta Essentia yacht is integrated subtly into the design through details, colors and patterns which are displayed against an absolute and pure white background. 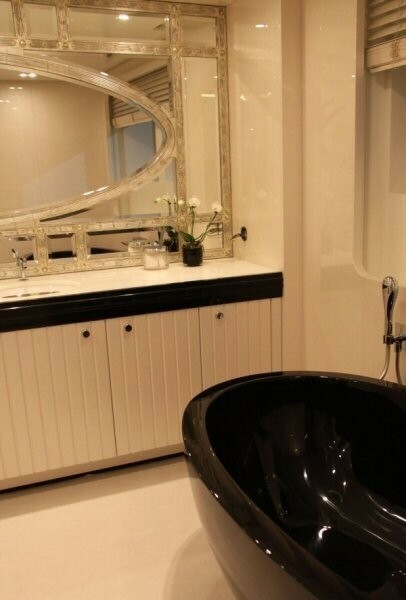 The rich cream salon boasts a relaxing and liberating air of spaciousness, enlivened by a dash of deep aubergine and a scattering of bright florals. 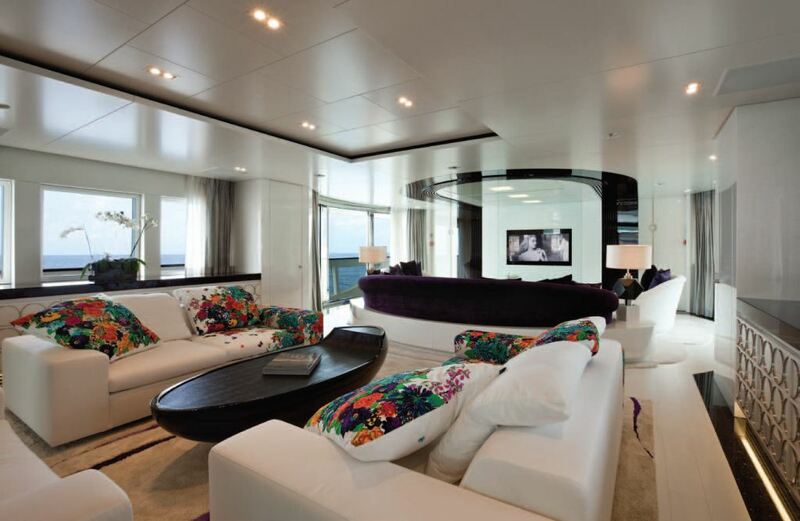 The interior is flooded with natural light thanks to the wide windows and generously proportioned balconies. 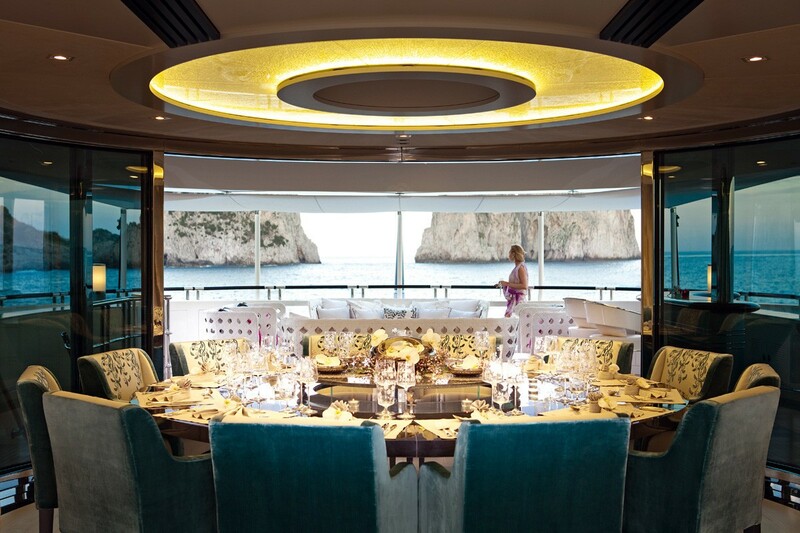 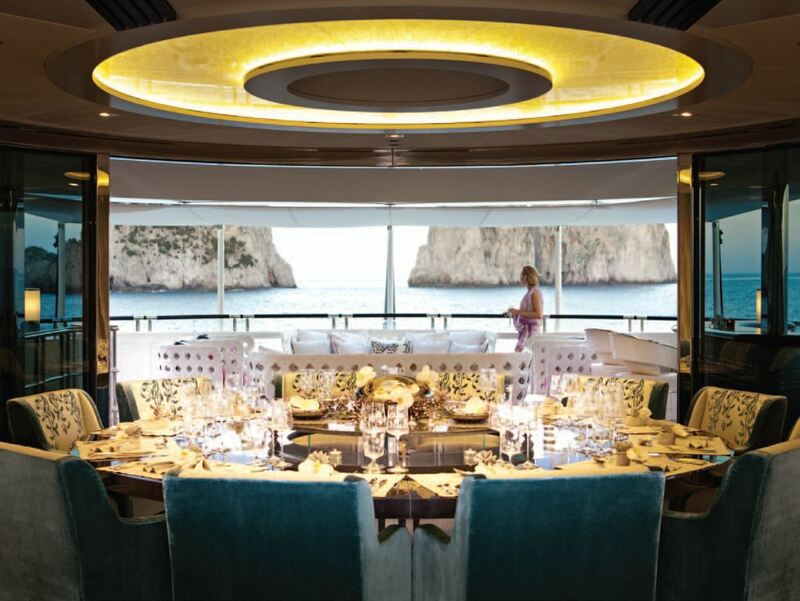 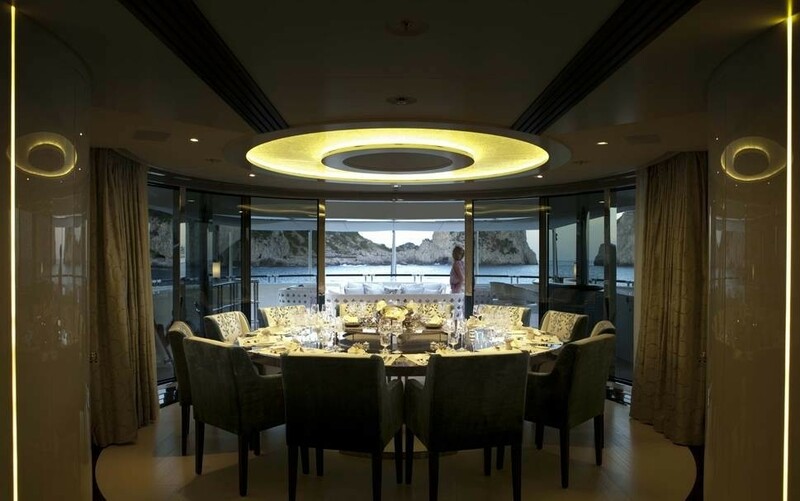 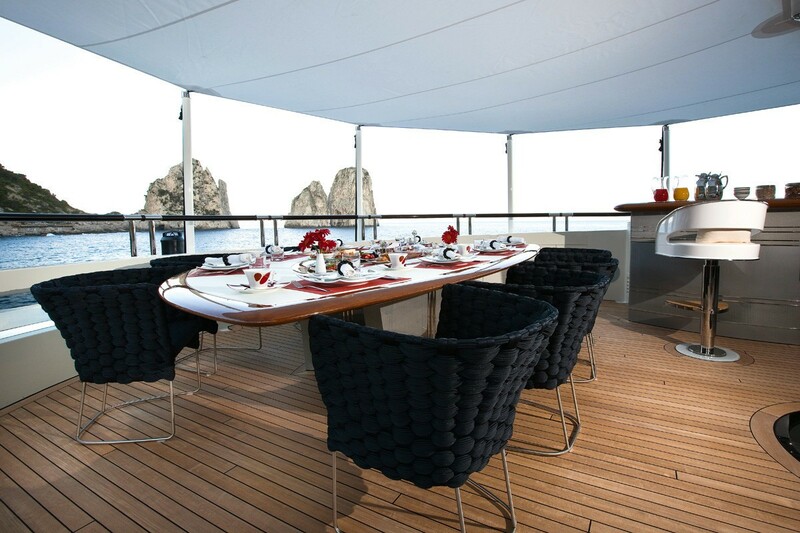 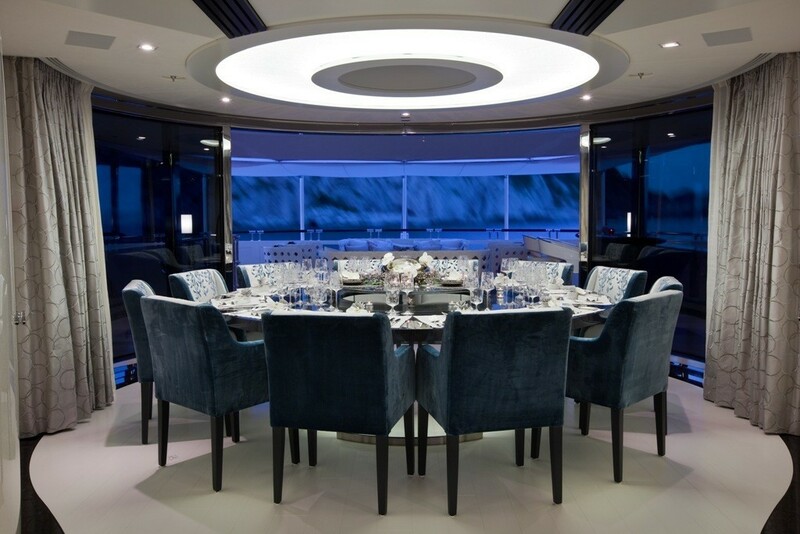 The large circular formal dining table on the upper deck is laid to perfection, with divine cruising prepared by a top-class chef and silver spoon service. 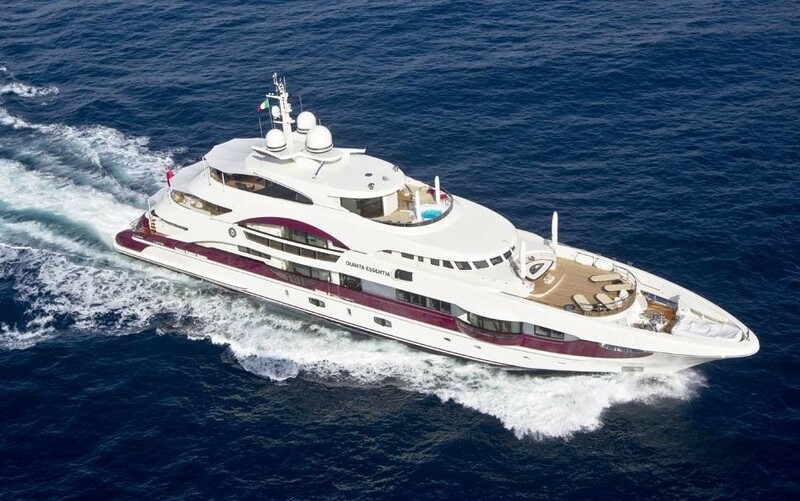 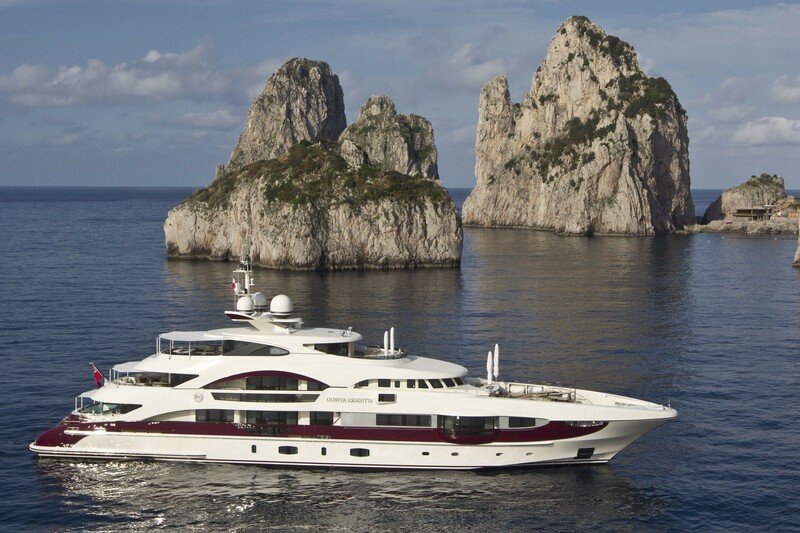 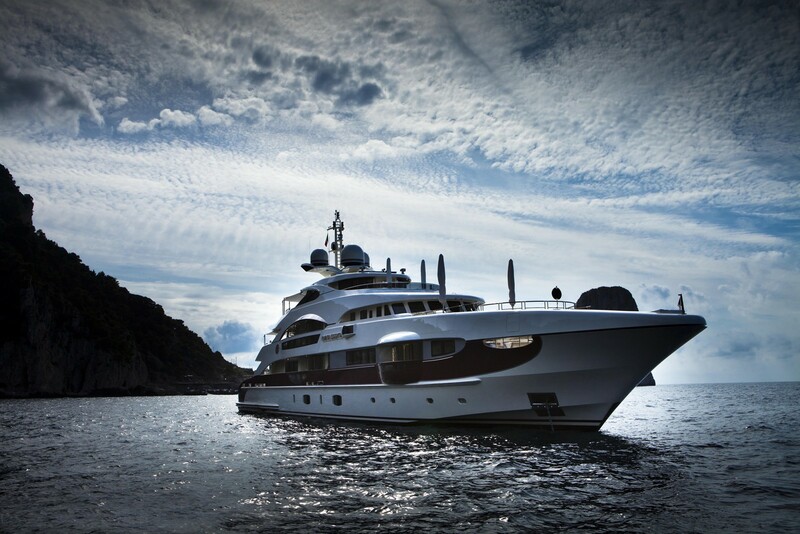 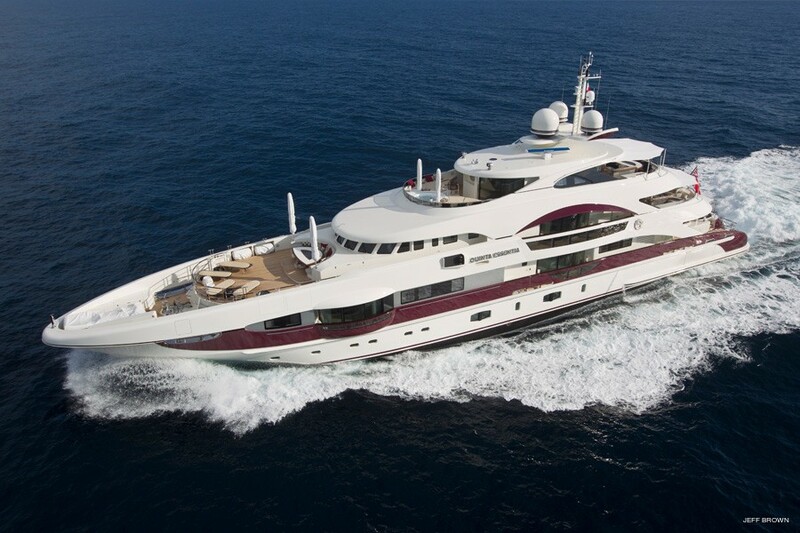 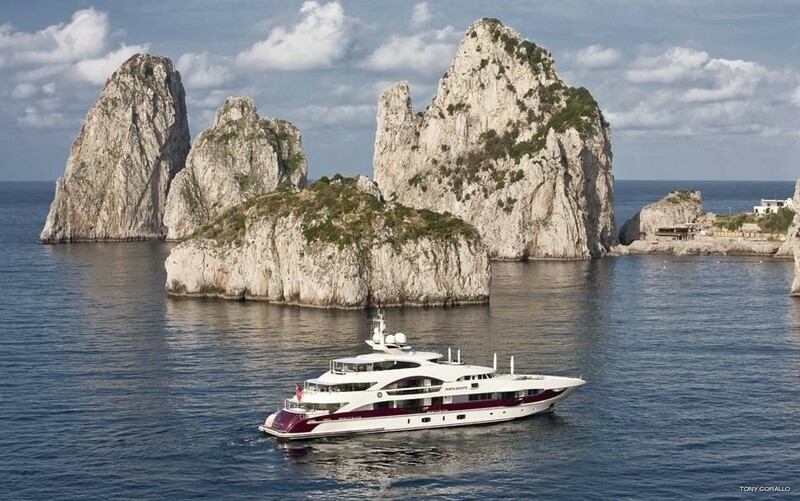 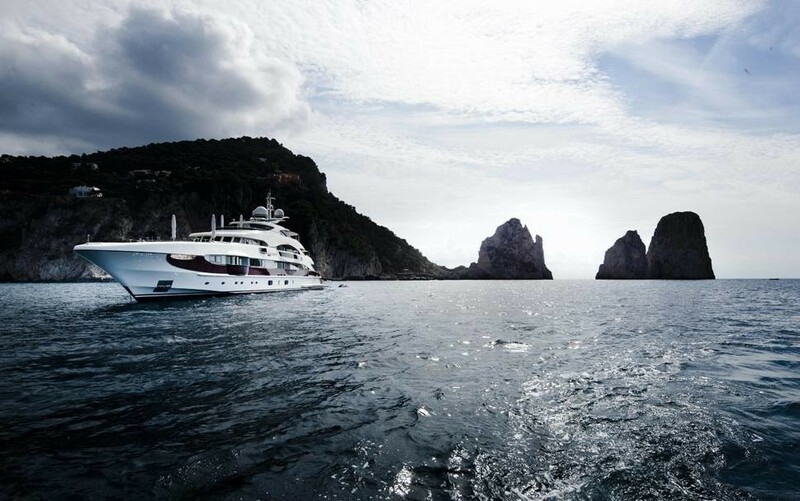 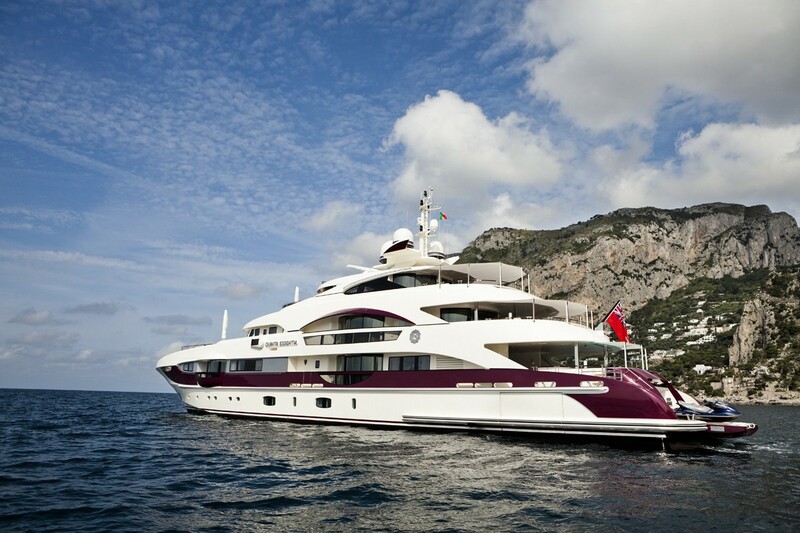 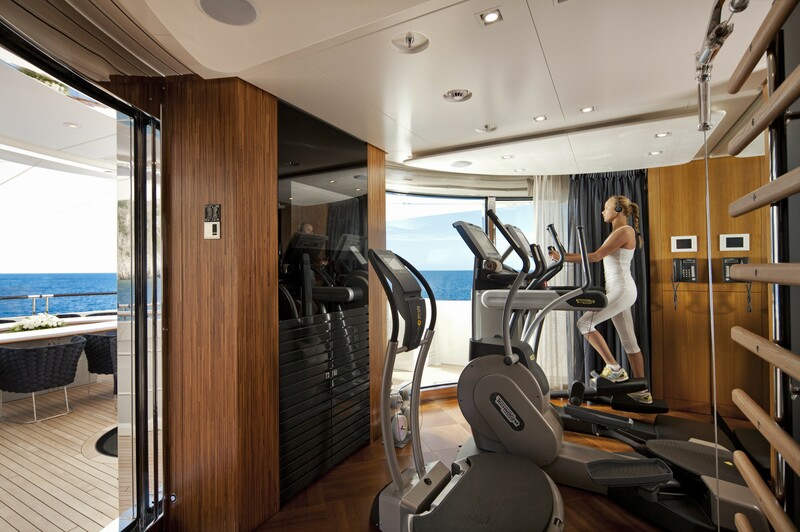 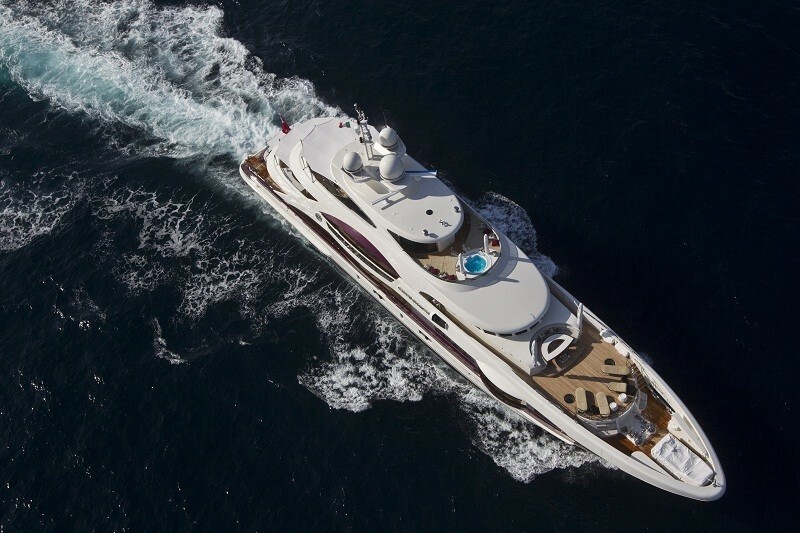 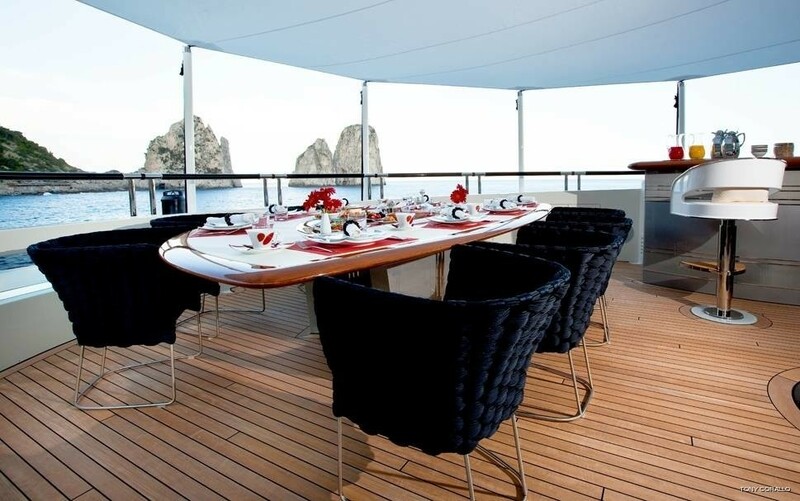 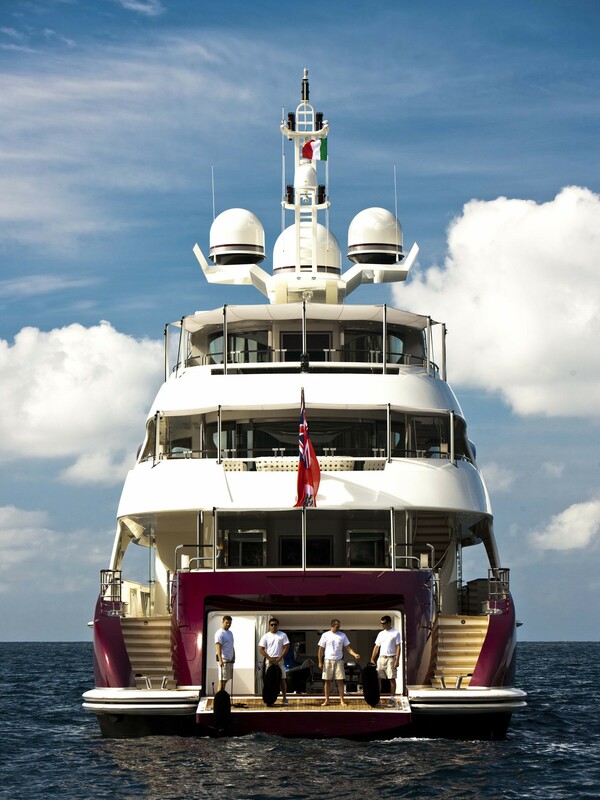 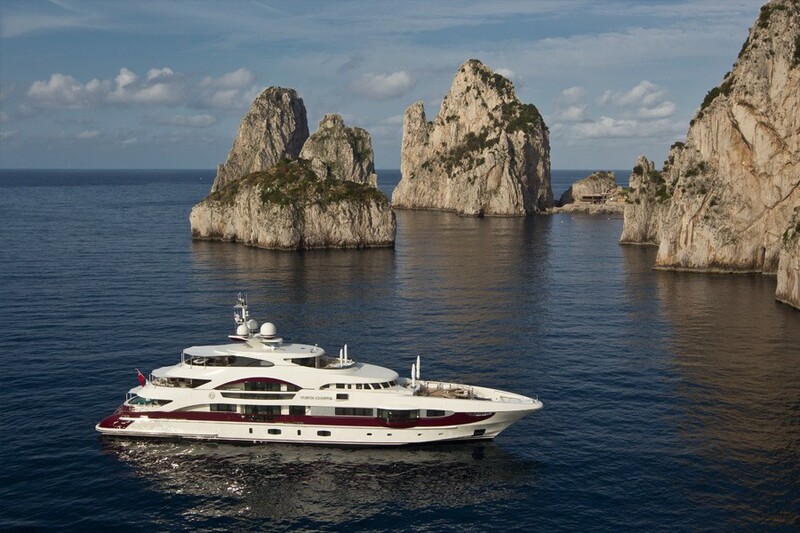 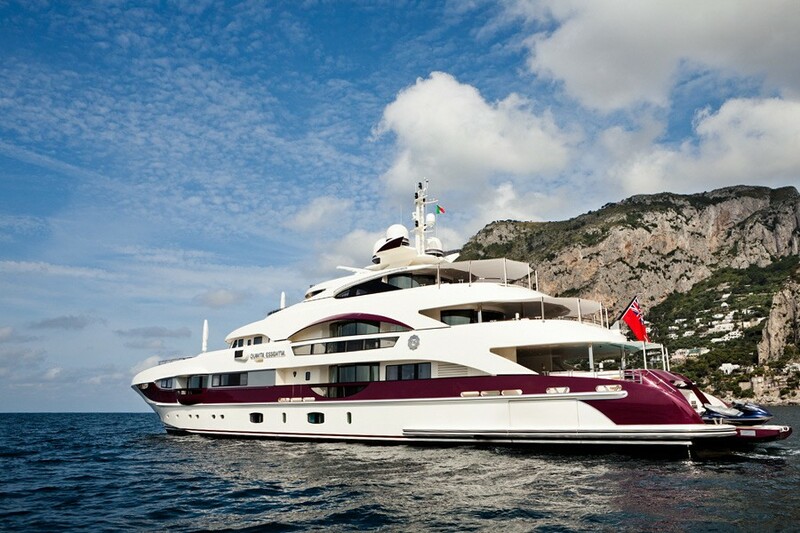 M/Y QUITE ESSENTIAL has a fully equipped gym with a 180-degree view of the ocean. 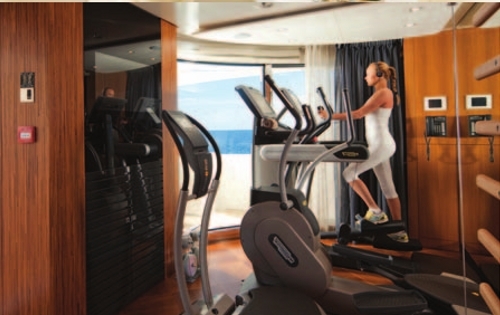 Equipped with the latest fitness machines, an efficient and effective workout, is possible while enjoying the finest in high definition entertainment. 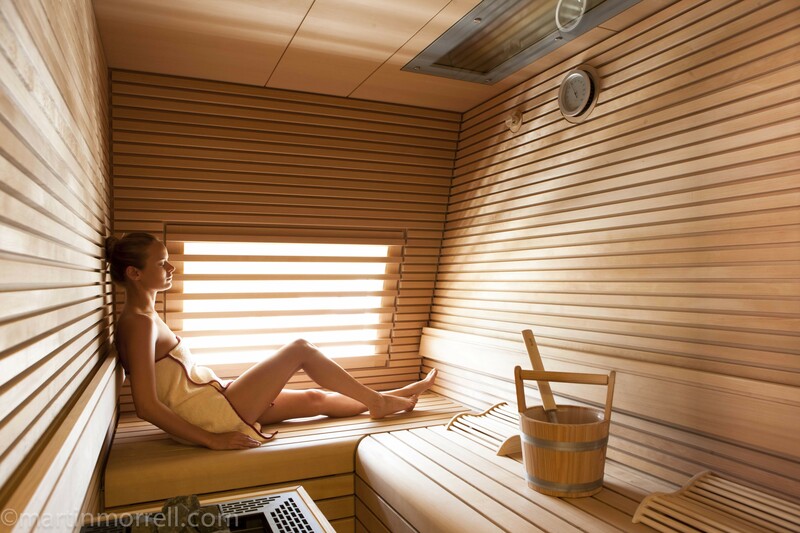 For those onboard wanting a more soothing and therapeutic experience, enjoy the services of the onboard professional masseuse, let off some steam in the sauna or scrub down in the fragrant hammam. 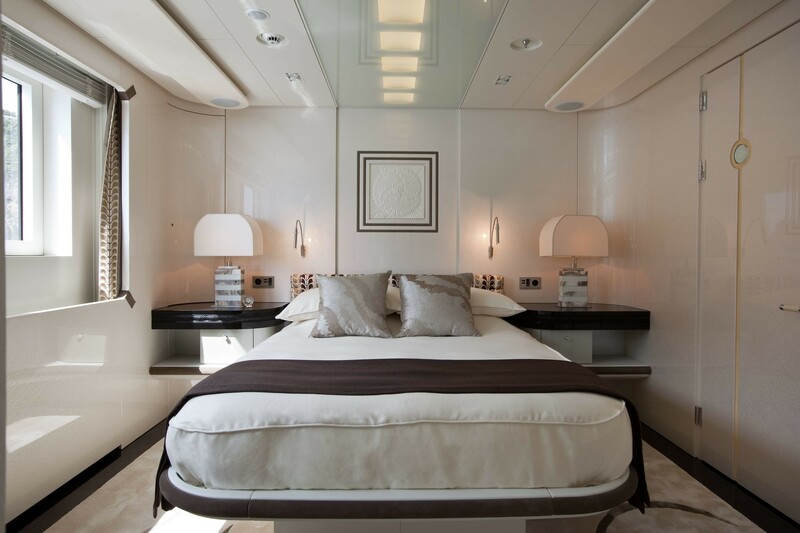 QUITE ESSENTIAL charter yacht offers accommodation for up to 10 guests in 5 suites: a VIP cabin, three double cabins and one triple cabin. 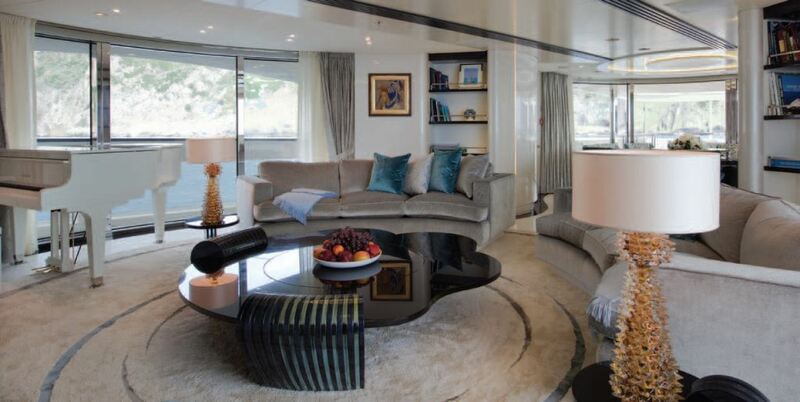 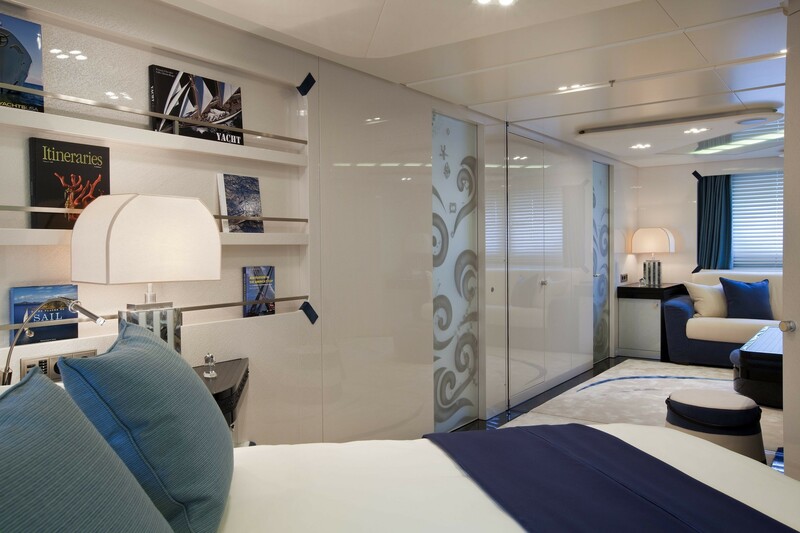 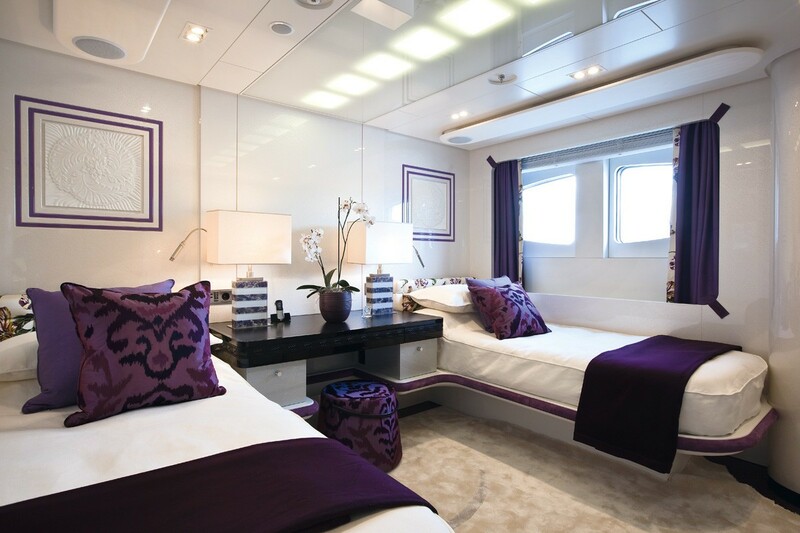 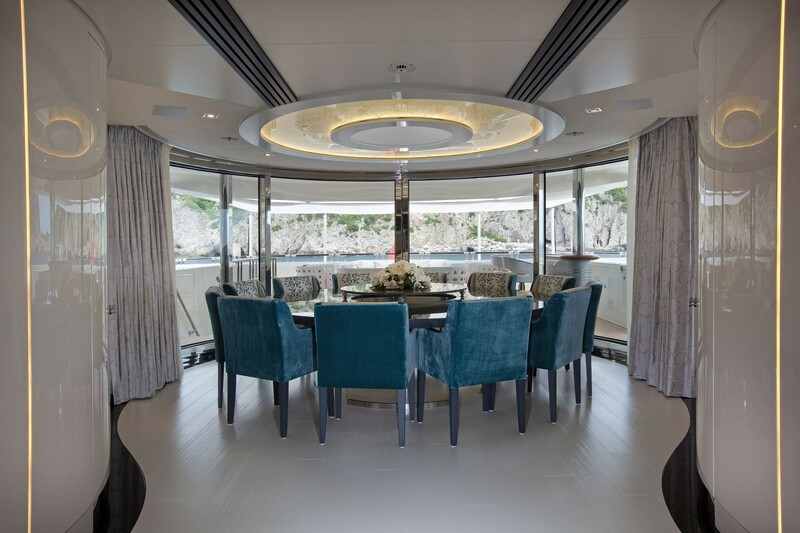 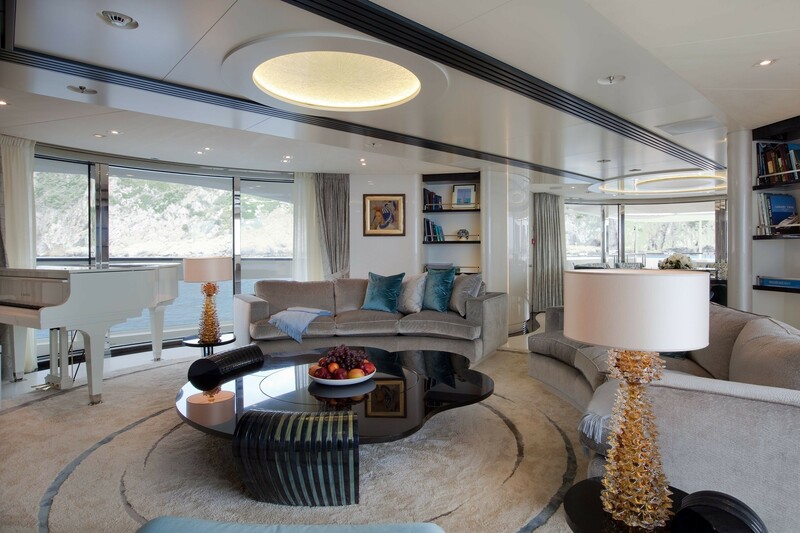 The owners suite located forward on the main deck is dominated by the colour silver, reflecting the bold colours of the four earthly elements in the guest cabins - creating an interpretation of the mythical fifth element, the quinta essentia. 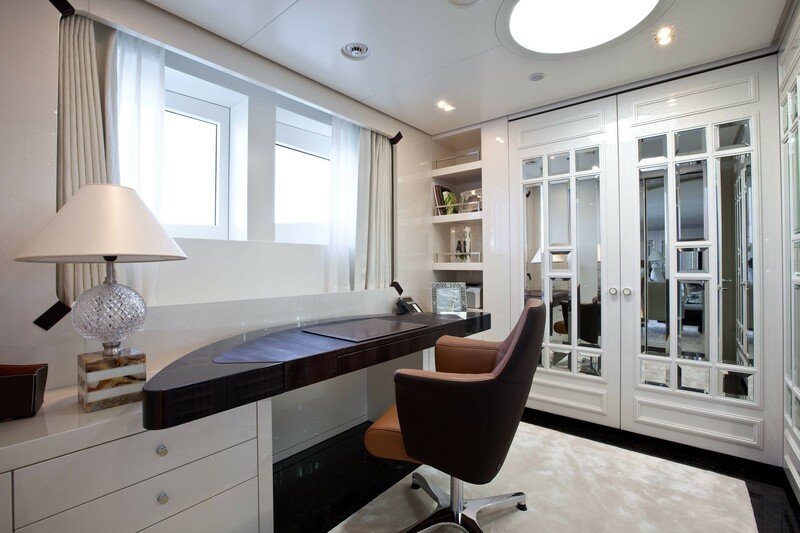 The owner’s suite extends into an elegant and private office area. 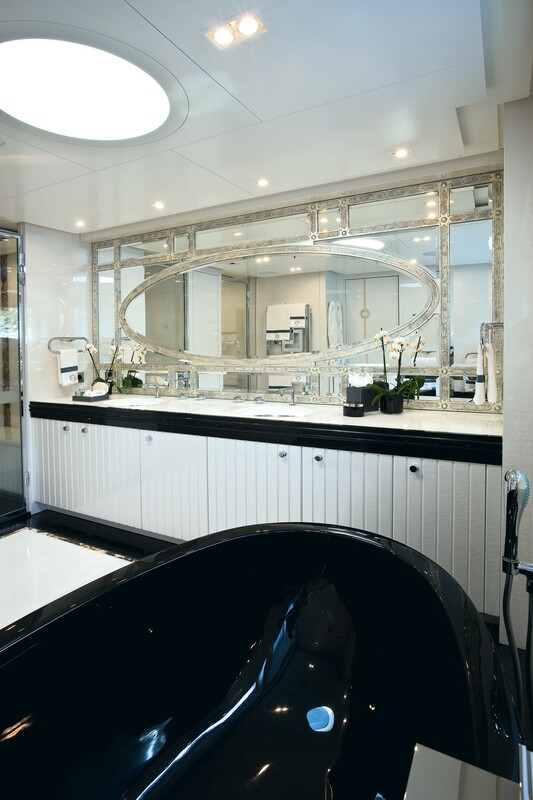 The black, white and mirrored master bathroom combines modern and classic elements - a black stone bath tub and a wall of mirrors with silver leaf frames. 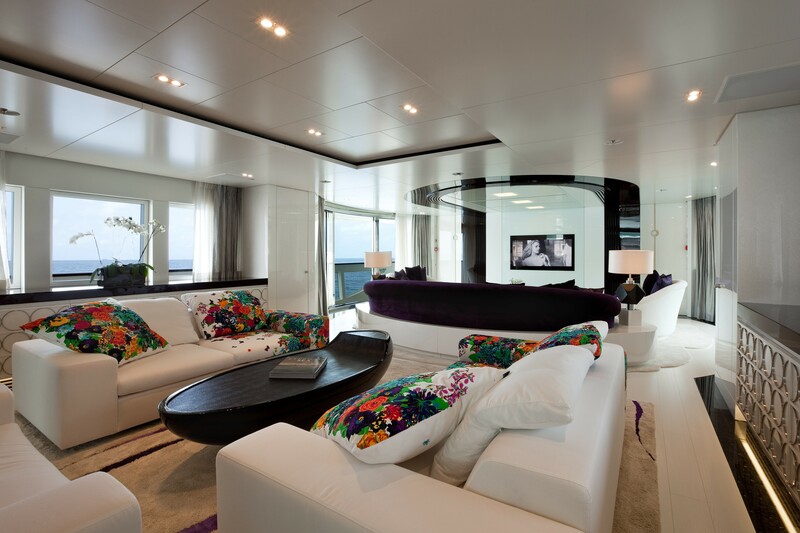 Superyacht QUITE ESSENTIAL’s remaining cabins are earthy, fiery, bright and cool hues dramatically offset by the pure white background. 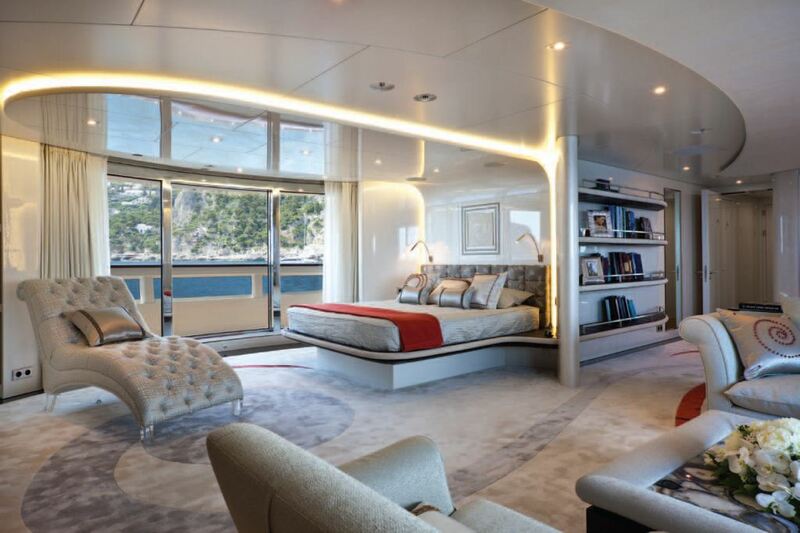 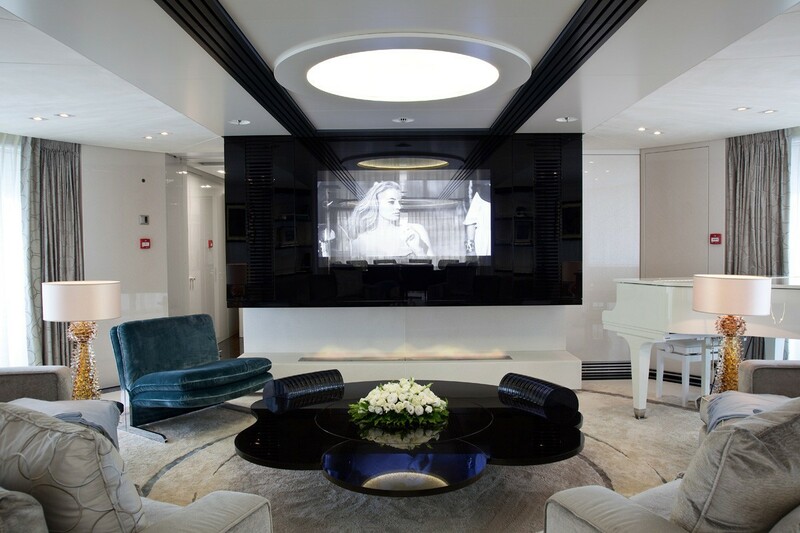 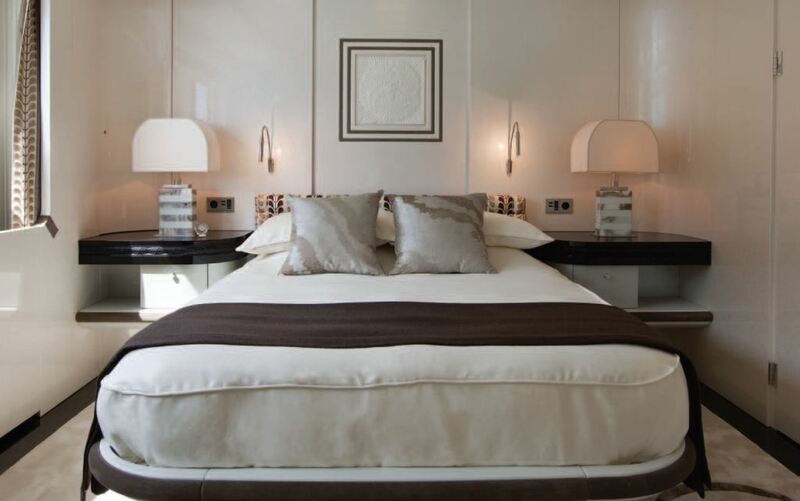 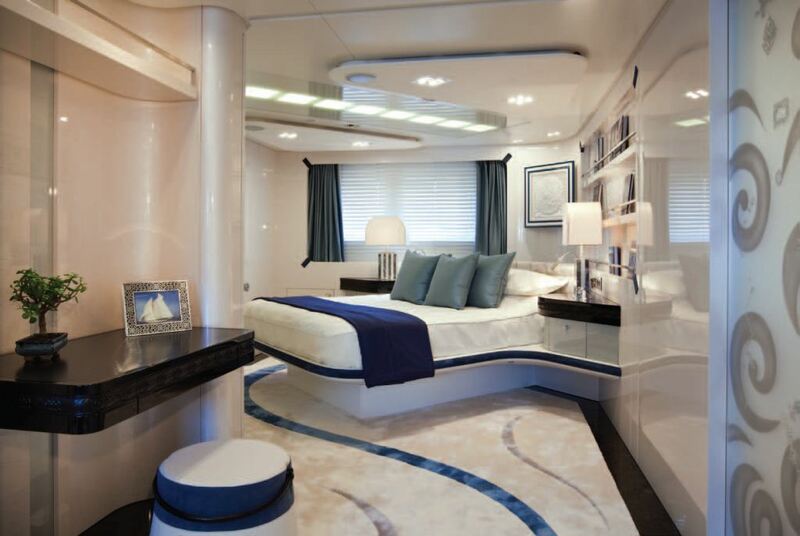 Carpeting throughout the yacht is in hand-woven white silk, with a single, tapering, wave-like brush-stroke, in shades to represent each element. 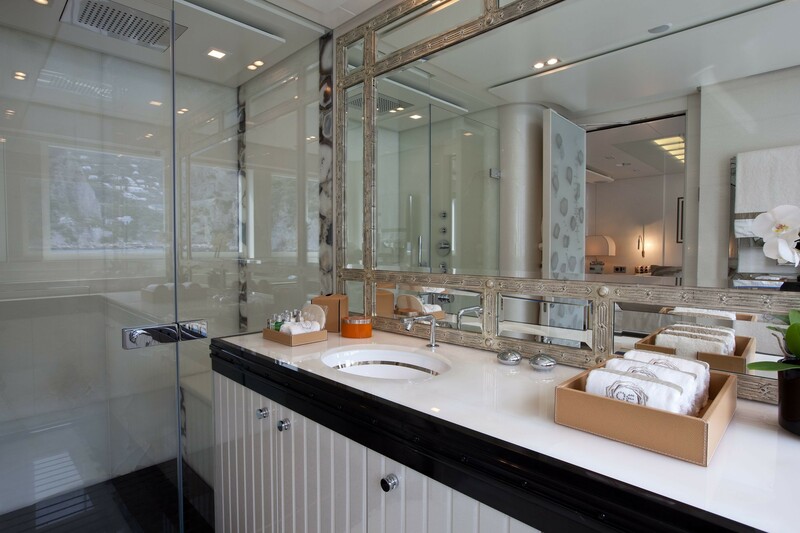 The doors to the guest rooms are decorative glass, hand-made at Pictet atelier. 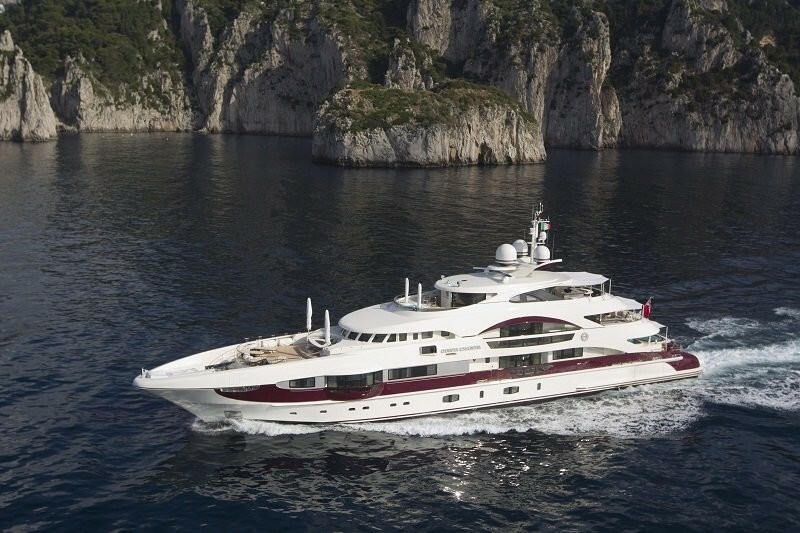 QUITE ESSENTIAL charter yacht has a striking exterior profile coloured an off white with a contrasting deep red band running from the transom almost to the bow. 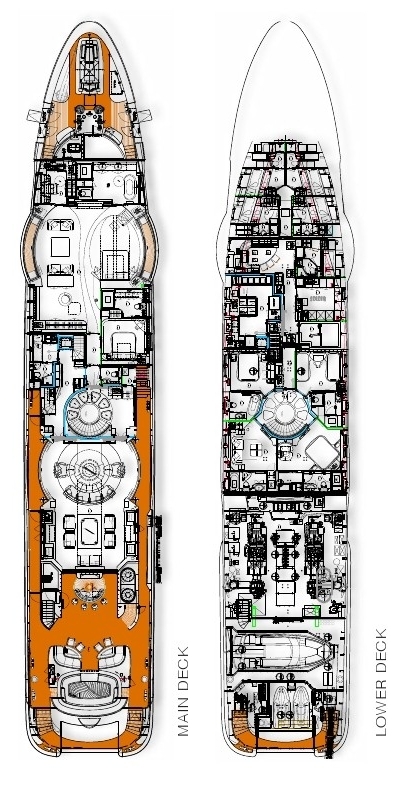 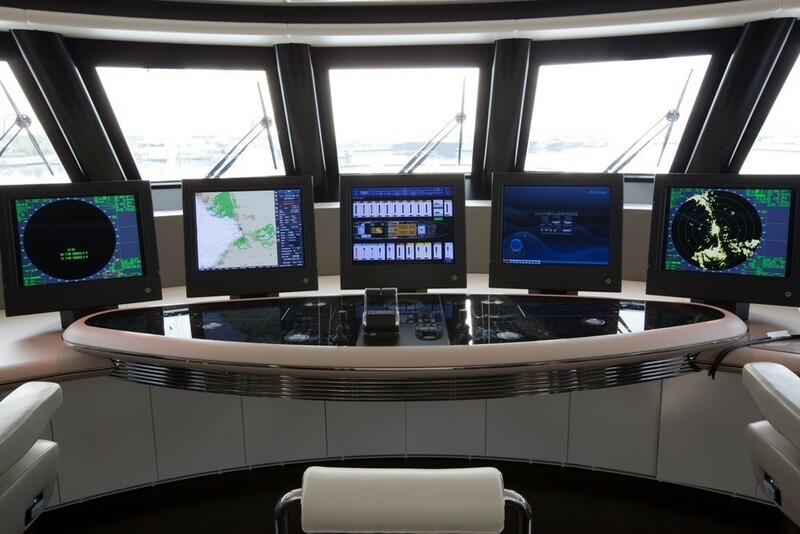 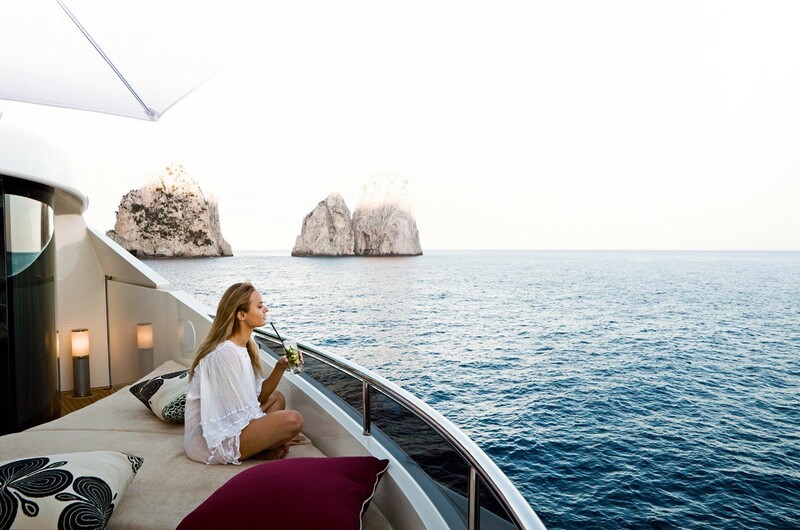 The all-aluminium yacht also has signature curved balconies and windows in the owner’s suite located forward on the main deck and on the salons on the main and upper deck. 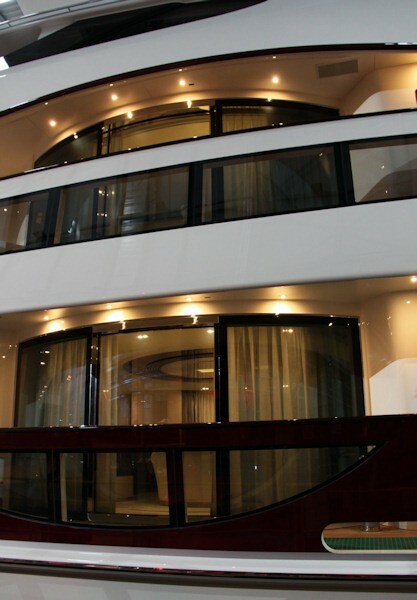 These balconies are glazed to allow clear views of the surrounding vistas even when seated inside. 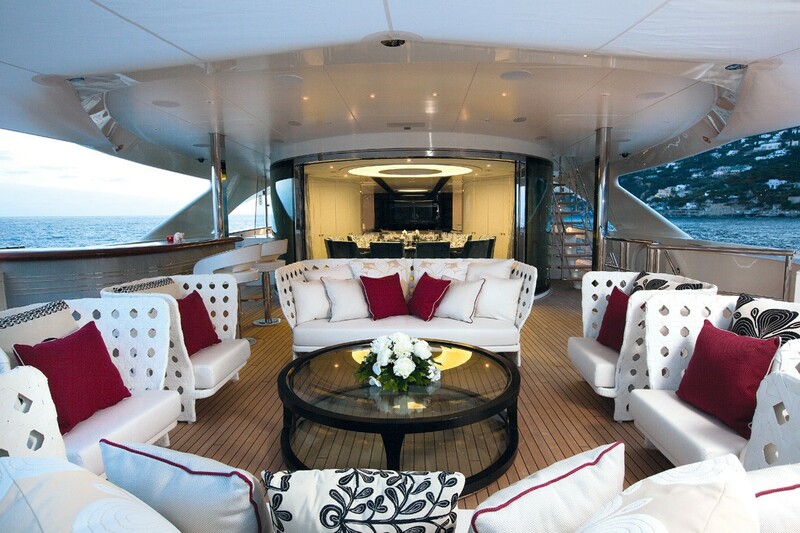 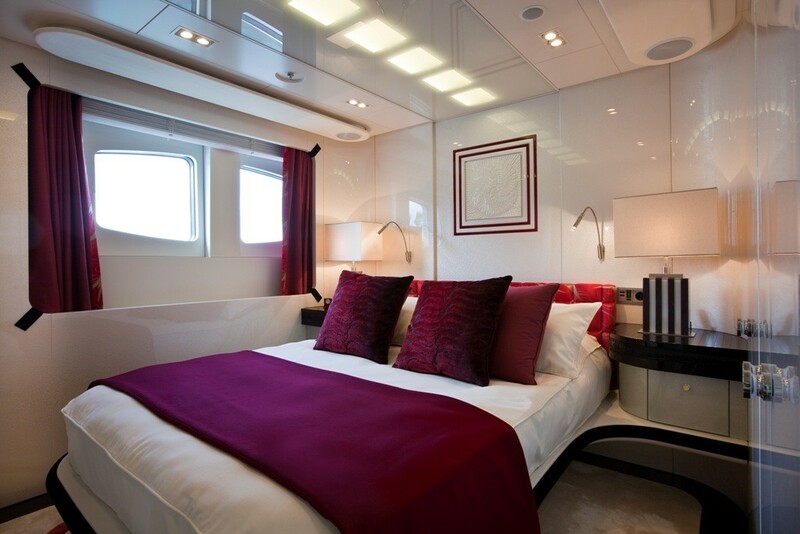 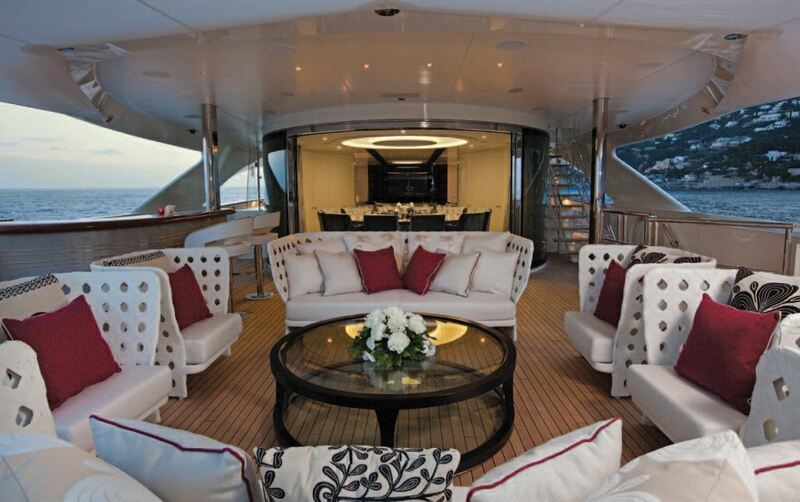 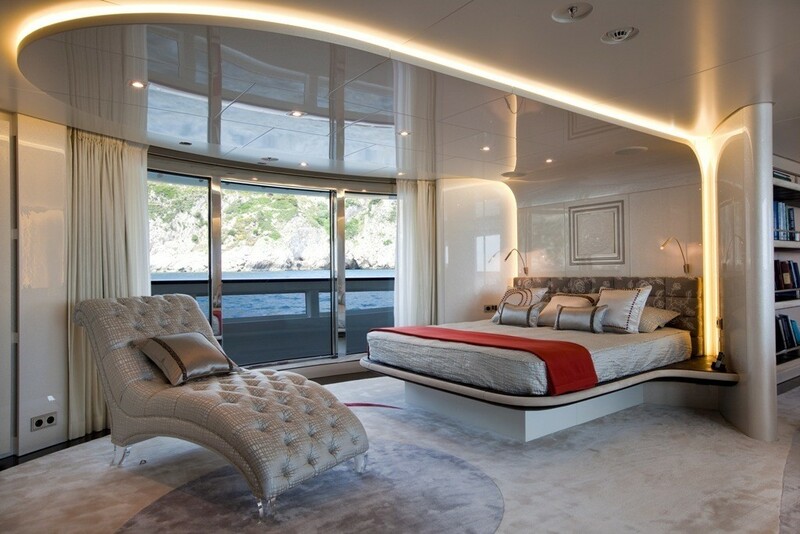 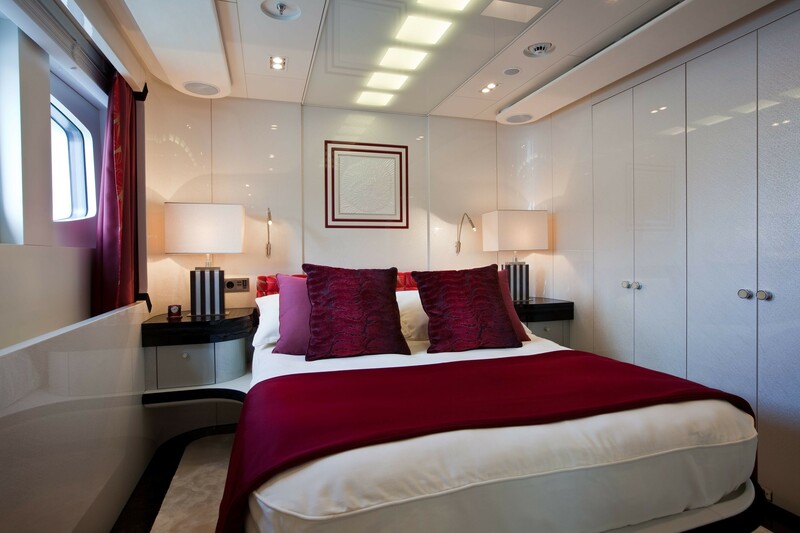 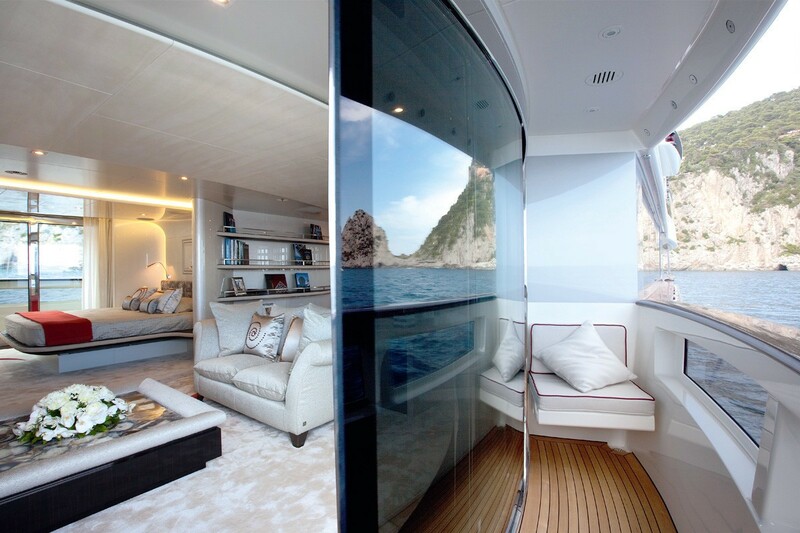 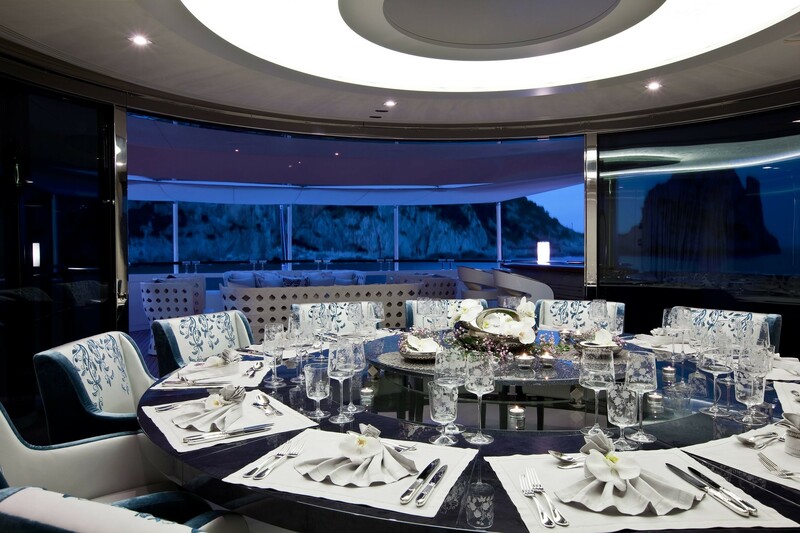 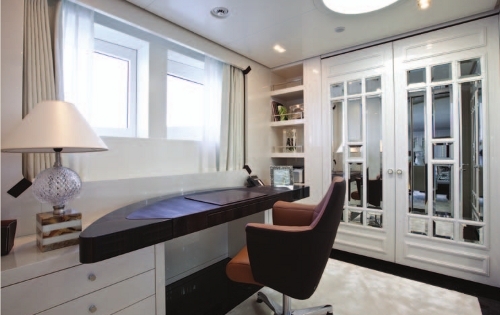 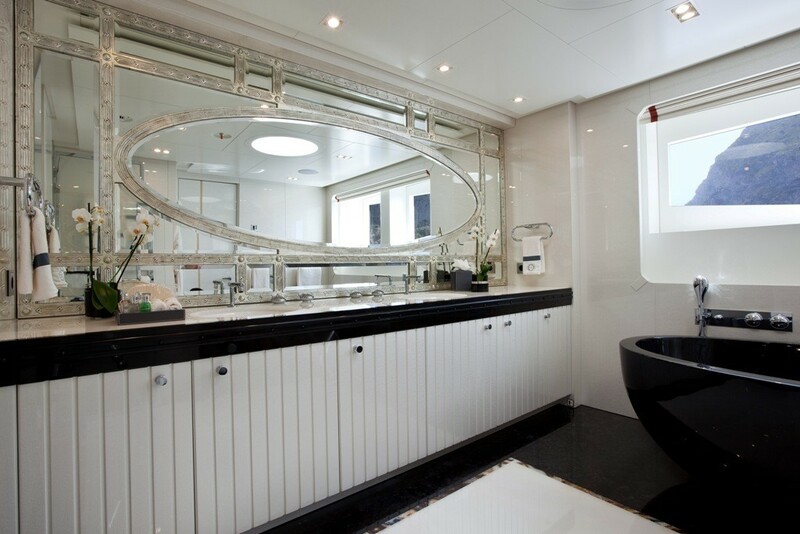 The yachts interior is very spacious with a light and stylish design by Michela Reverberi. 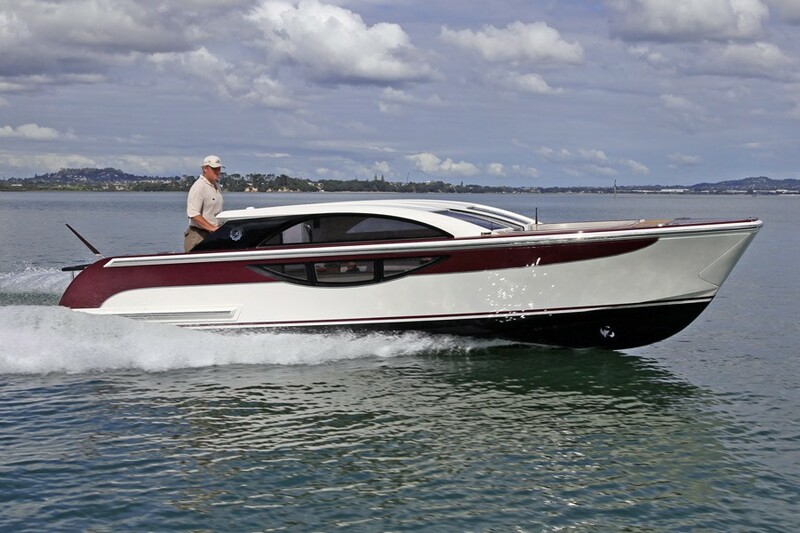 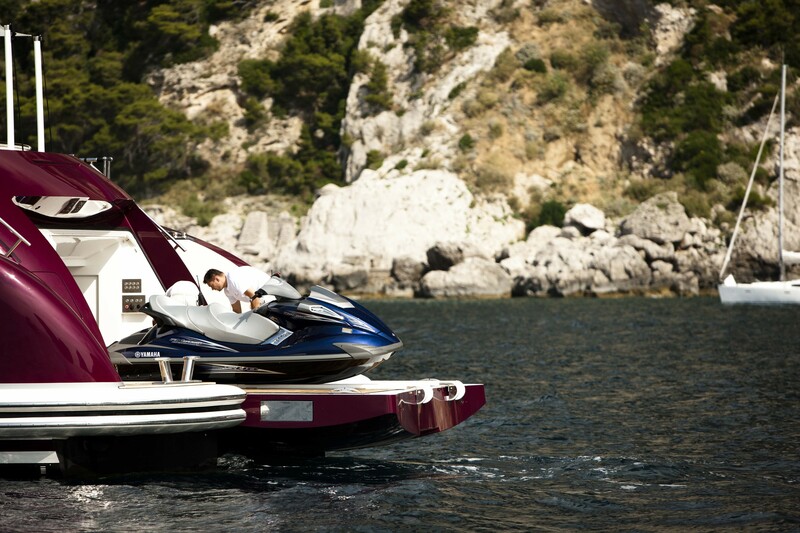 The yacht's tender is located in the tender bay with an upwards opening door. 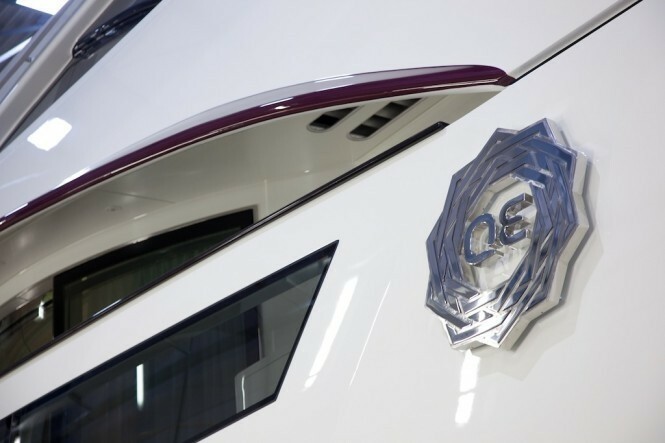 Motor Yacht QUITE ESSENTIAL is powered by twin 4.300kW, MTU 20V 4000 M93L diesel engines, enabling her to reach a notable top speed of 24 knots, quick enough to carry her guests in comfort and style along the French or Italian Riviera’s in no time. 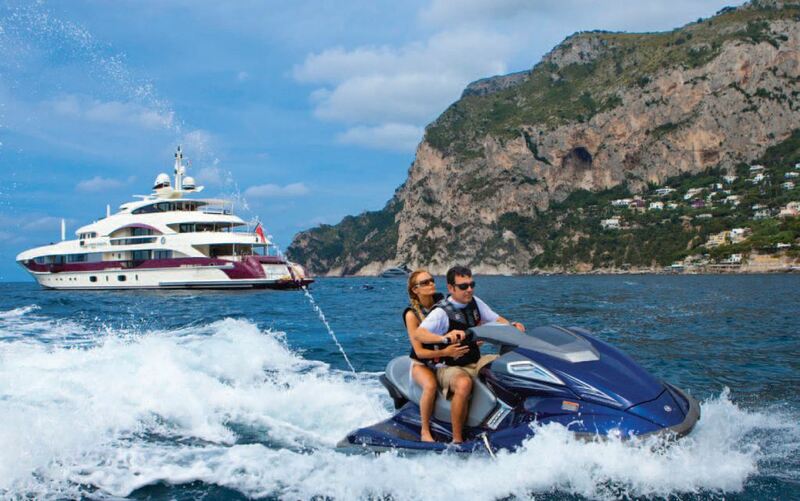 With the yacht’s selection of up-to-date waverunners, sea bobs and inflatables, guests can explore the coastline, or have an adrenalin-fuelled, action-packed day. 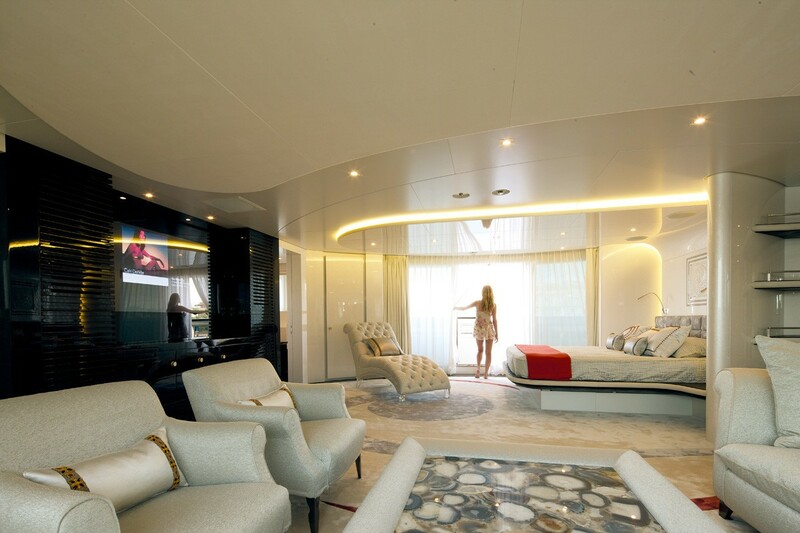 QUITE ESSENTIAL is able to accommodate up to 12 charter guests in 6 cabins including an owner’s suite, a VIP cabin, three double cabins and one triple cabin.